On this page I will be posting AncestryDNA results of West Africans with confirmed ethnic background(s). Unlike for Afro-Diasporans in the Americas these results can therefore be verified with known genealogy. This should be helpful to improve correct interpretation and also to determine how reliable/predictive the various African AncestryDNA regions might be. Specifically on this page I will focus on results from Liberia, Ivory Coast, Burkina Faso, Ghana, Togo and Benin (shown in red in map 1.1). Nigerian results have already been discussed on a separate page (any future results from Niger & Chad will be posted there as well). 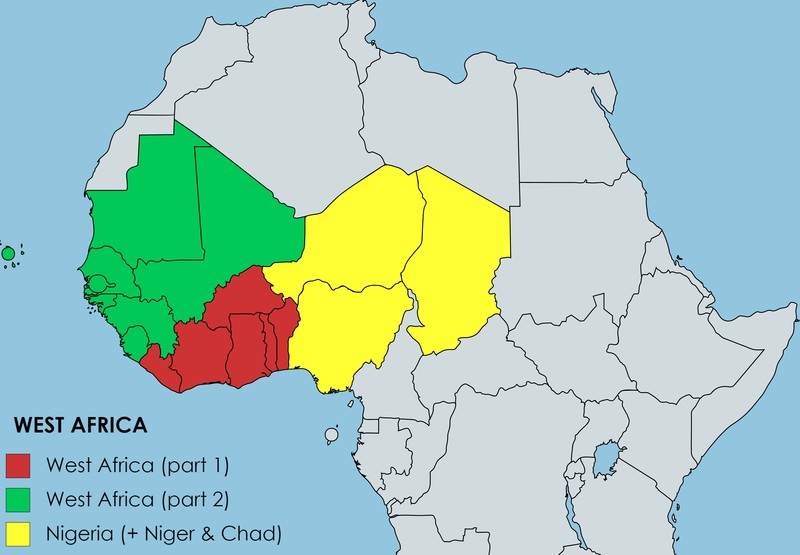 Results from the remaining West African countries (shown in green in map 1.1): Senegal, Gambia, Mali, Mauritania, Guinea Bissau, Guinea Conakry and Sierra Leone will be discussed in the second part of this exploration of West African DNA results. I will first present a summary of my main findings in section 2. I will provide more detailed analysis & relevant context in section 3. In the very last part of this page (section 5) I will discuss the implications these West African results might have for Afro-Diasporans. 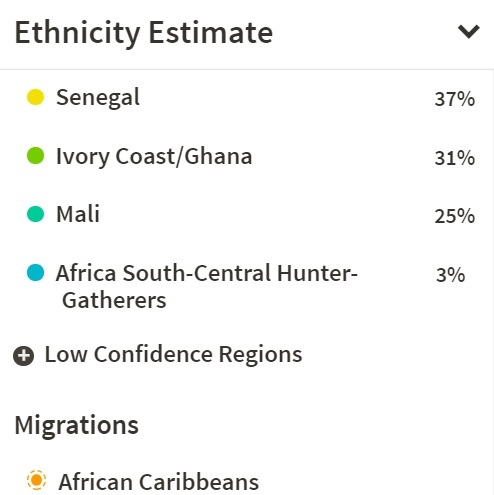 If you want to skip the discussion just scroll to section 4 to see screenshots of individual West African AncestryDNA results. 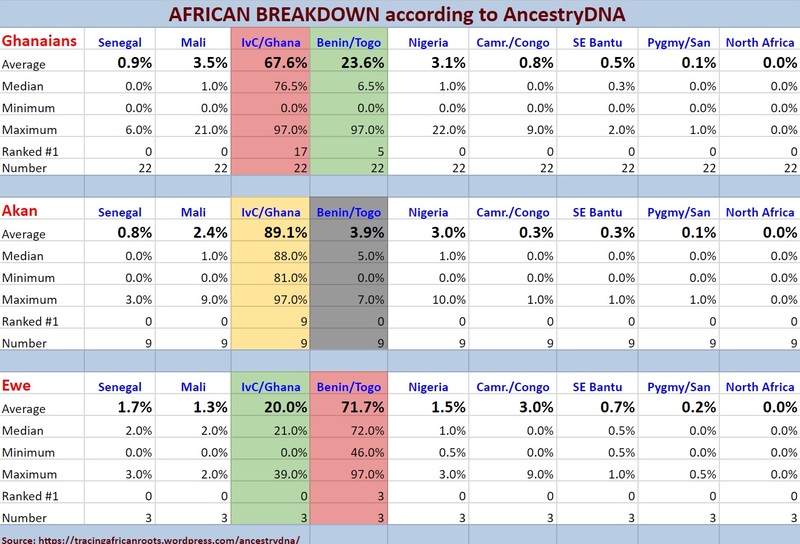 The screenshots of these various West African AncestryDNA results form the basis of my survey findings. I have grouped them by country and when possible also by ethnicity1. The backgrounds behind these West African results were verified by me in the best way I was able to. Mostly based on statements made by the persons who did the AncestryDNA test but in a few cases I also distilled a likely ethnic/national identity by way of other clues (usually family names and family locations). In these latter cases I have added a question mark in the header. Therefore a 100% accurate depiction of self-identification is not intended. The ethnic headers are merely meant to provide additional perspective. Even if at times only approximate info was available to me. Naturally I respect everyone’s right to self-identify as they please. My accompanying comments should be taken as informed speculation on my part they are not meant to exclude other possibilities or simplify complex family histories. 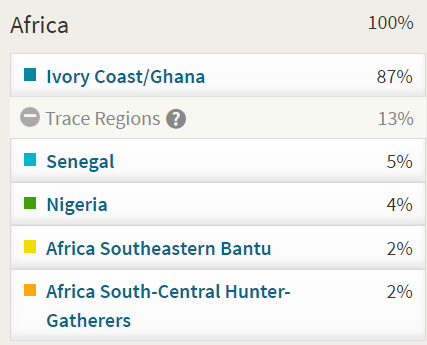 The number of West Africans being tested on AncestryDNA is still very limited but fortunately it is growing! Which is good news as DNA testing can be educational, illuminating, entertaining, beneficial etc. for native Africans as well! Even if you already know your ethnic background, you might still be keen to learn more about your (deep) ancestry. Afterall many West Africans might also not be fully aware of the ethnic backgrounds of ancestors from several generations ago, let alone several centuries ago. So their results might even hold some surprises. Also making connections with Afro-Diasporan DNA matches can be inspiritional & gratifying. At any rate you do not need to have all sorts of “exotic” admixtures to take a DNA test that’s worthwhile! It’s your own personal ancestry that you are researching and socalled “admixture” can also be defined in ethnic or intra-African terms. DNA testing is not only reserved for Americans. Also Europeans, Asians and Pacific Islanders are taking these tests because they want to learn more about their heritage! 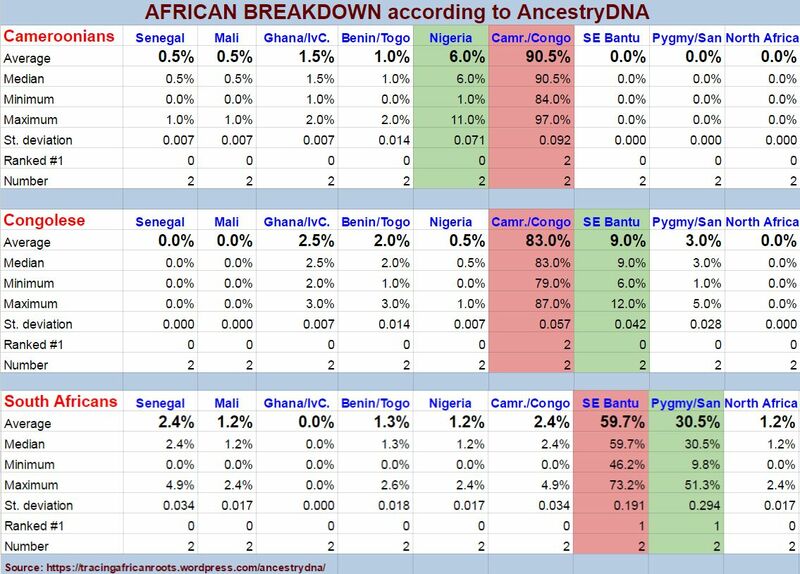 As these results below show many West Africans are in fact of “mixed” background if you go along with the regional framework provided by AncestryDNA. As I will continue to say it is counter-productive to get distracted by the country name labeling. Rather consider the AncestryDNA regions to be proxies of ancestral components which have become more frequent in certain loosely defined areas but still show a wide dispersal in neighbouring areas as well due to ancient migrations and inter-ethnic unions occurring probably since the dawn of mankind! If you invest some time in learning how to truly “read” the results they can still be very informational in my opinion. Don’t take the country name labeling of the regions too literally. The regional percentages firstmost signal close genetic similarity to the samples taken from the countries after which the regions have been named. Actual origins from neighbouring countries should not be ruled out. Almost all African countries have been colonial creations with borders cutting right through the homelands of ethnic groups. Closely related ethnic groups can often be found on both sides of the border. Most DNA is common in many populations, just at different frequencies. Due to either migrations or shared origins dating back from hundreds or even thousands of years. For this part of West Africa in particular the migrations associated with speakers of various language groups such as Kwa, Gbe, Gur and Kru are a factor of paramount significance. 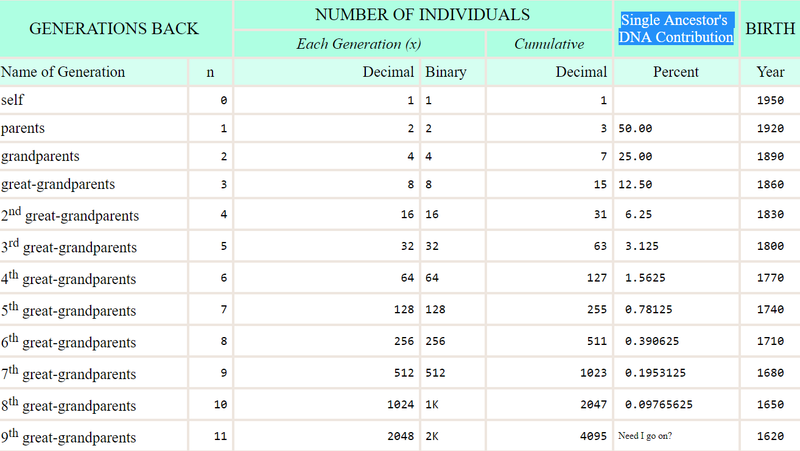 Sometimes (very) ancient admixture rather than any recent lineage is suggested by these AncestryDNA estimates. And in this way some of these regional scores might perhaps best be seen as genetic echoes from a (very) distant past. Beyond family tales, historical knowledge or even ethnic origin traditions. Ethnicity is a construct which evolves across time due to ethnogenesis. Generally speaking therefore ethnic groups do not possess unique DNA markers. Especially in comparison with neighbouring ethnic groups or from within the same wider region. The most common scenario being a genetic gradient which causes ancestral components to gradually fan out. As can be verified from my survey. However by closely studying the regional combinations being reported for West Africans we can still learn a great deal. Inspite of individual variation group averages do tend to provide more solid ground to make meaningful inferences when specifying someone’s ancestral origins. Also finding out where a specific region is most prominent or rather most subdued holds valuable lessons. The statistical data displayed in chart 2.1 is evidently based on a minimal sample size. Some West African countries are not yet being covered (such as Burkina Faso & Togo). Furthermore all of the included countries themselves harbour a multitude of ethnic groups. Right now however I can only make statistic calculations for a few well represented ethnic groups within Ancestry’s customer database. It should be obvious therefore that a greater degree of genetic diversity and individual variation might be expected across West Africa and also within the listed countries. Some of this diversity is already being shown by the Ghanaian results representing about half of my sample group (for this part of West Africa). We can verify that the so-called “Ivory Coast/Ghana” region is indeed quite predictive for the 9 Akan samples (89%) and to a lesser degree also for the 3 Ga-Adangbe samples (67%). However for the 3 Ewe samples it is instead so-called “Benin/Togo” which is most prominent (72%)! This is something I had anticipated right from the start when I began my AncestryDNA survey five years ago already in 2013. Eventhough only preliminary statements should be allowed at this stage I highly suspect that these group averages are already a reasonably good approximation of the main regional components to be found within the genepool of this part of West Africa. Atleast according to AncestryDNA’s current reference panel. 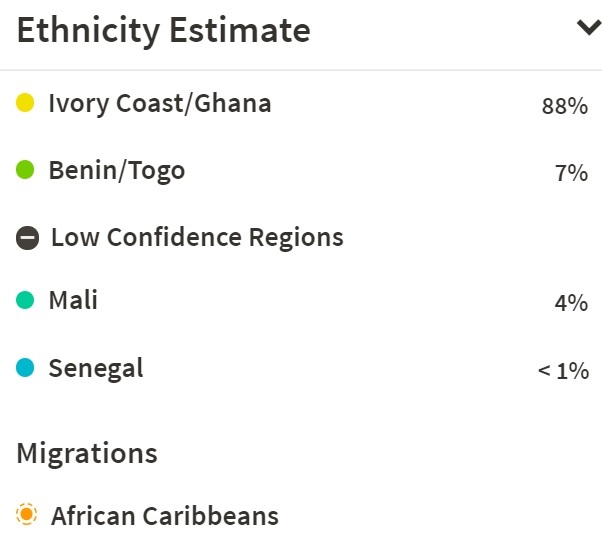 The group averages I have calculated so far being more less in line with how the “typical native” scores according to Ancestry’s information: respectively 86% for “Ivory Coast/Ghana) (n=115) and 82% for “Benin/Togo” (n=60). South-Central Hunter-Gatherers” suggestive of remnant West African Pygmy DNA? One of the main outcomes of my West African survey so far is that based on group averages so-called “Ivory Coast/Ghana” is most prevalent in Liberia. And not as you might assume in either Ivory Coast or Ghana. 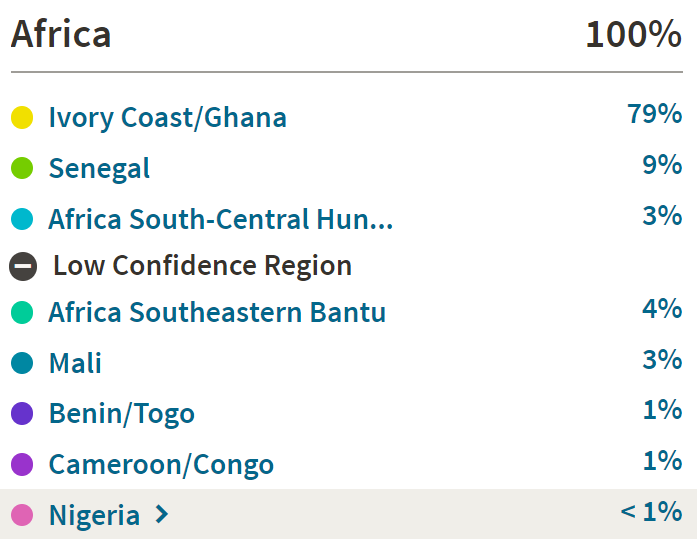 Liberia is currently not featured with its own region on AncestryDNA. That’s why it is only logical that Liberian DNA will be described in terms of the existing 9 African regions. Given Liberia’s geographical location an intermediate outcome between “Ivory Coast/Ghana”, “Mali” and “Senegal” was to be expected therefore. 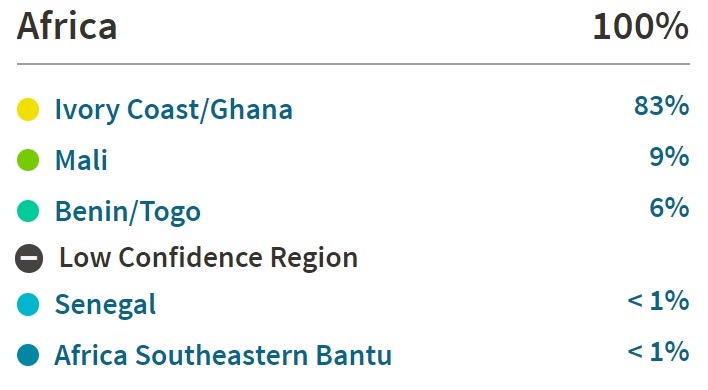 To be sure all of these three regions do indeed show up in Liberian results. But by far “Ivory Coast/Ghana” has turned out to be predominant. Even when for one result it was instead “Senegal” which was the biggest region. Undoubtedly this is linked to ethno-linguistical background as will be explained further below. Actually so-called “Ivory Coast/Ghana” is also being reported with substantial amounts in Sierra Leone. Much for the same reasons as for Liberia, its neighbouring country. 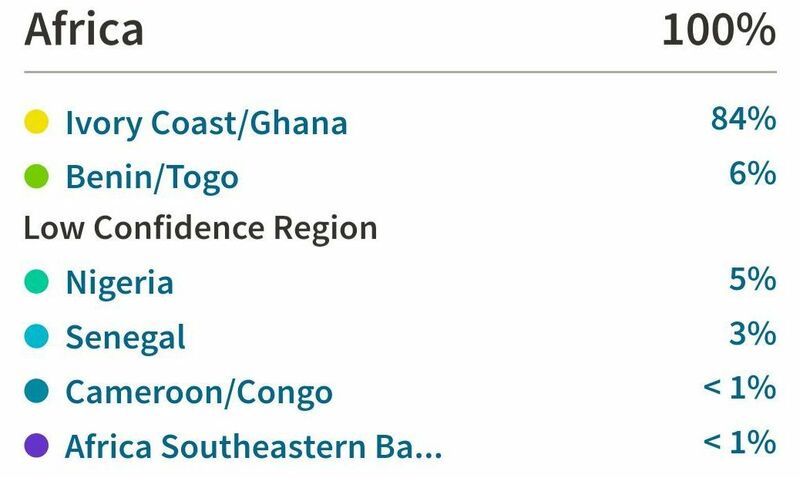 Afterall Sierra Leone is also not appearing with its own region on AncestryDNA. The Sierra Leone context is however more complex because it seems to have a greater Upper Guinean influence (“Senegal” and “Mali”) compared with Liberia. Furthermore also the usually quite mixed (within Africa) background of the Krio people complicates any straightforward interpretation. This will be discussed in greater detail in “West African Results, part 2”. Based on what I have seen so far I can already say that it might be expected that especially Mende people and other ethnic groups from southern Sierra Leone will score high “Ivory Coast/Ghana” scores. On average perhaps in the range of 40-50%. The “Ivory Coast/Ghana” region is also frequently showing up (above trace level) in the results of other West African countries. As far north as Senegal and as far east as Nigeria (also mentioned in map 3.1). However much more subdued and so far never as primary region, unlike what I have observed several times already for Sierra Leone (see my spreadsheet). Then again “Ivory Coast/Ghana” can of course also be very predictive of either Ghanaian or Ivorian DNA. But as my survey is demonstrating only as as long as you fit a certain ethnic profile. Keeping in mind that my sample size is still limited so far the highest “Ivory Coast/Ghana” scores (>90%) have been obtained for persons with either an Akan or Kru background. To be sure this does not mean that “Ivory Coast/Ghana” is an indicator of actual Akan or Kru descent! Other ethnic backgrounds might still be perfectly compatible with high “Ivory Coast/Ghana” scores. However this finding does seem to suggest that AncestryDNA might use samples taken from both Akan & Kru populations to calculate their so-called “Ivory Coast/Ghana” estimates. As far as I know Ancestry has not confirmed the ethnic backgrounds of their African Reference Panel. However just speculating I would say it’s very likely that Brong (Akan speaking) samples from Ghana were used. Possibly combined with Ahizi (Kru speaking) samples as well as Yacouba (south Mandé speaking) samples. Both from western Ivory Coast. 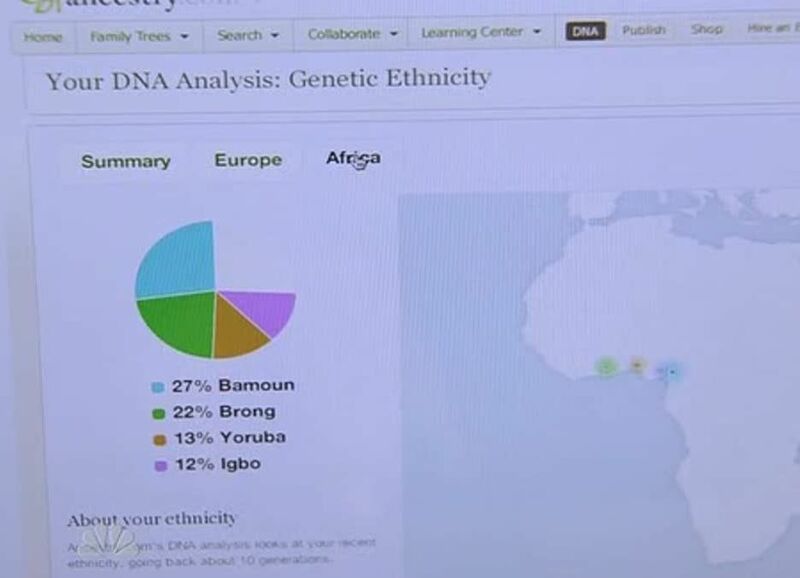 The Brong appeared in a pre-release version of AncestryDNA (see this screenshot). While the Ivorian samples have been used for atleast two genetic studies already (Brucato et al., 2010 & Fortes-Lima et al. 2017) and might have been included in the now defunct Sorenson Database which was bought by Ancestry.com a few years ago. Although again I have no certainty about this. Such a selection of samples might explain why Liberian Kru results and Ghanaian Akan results show the highest “Ivory Coast/Ghana” amounts I have observed so far. It would simply mean that genetically speaking they are a near perfect match to the samples within AncestryDNA’s database. Naturally so if these samples happen to be Akan and Kru like themselves! The possible inclusion of Mandé speaking Ivorian samples (Yacouba) might then explain why “Ivory Coast/Ghana” scores are still so frequently reported also across Upper Guinea as well as south Mandé speakers in Liberia. I need more results from those countries to confirm though. So far I have also not seen any complete results from Burkina Faso yet. But it might be expected that “Ivory Coast/Ghana” will be reported in substantial amounts over there as well. My ongoing survey now allows me to more solidly confirm what I had previously already outlined in the blog pages referenced above. The “Benin/Togo” region can indeed be predictive of genuine Beninese ancestry but not exclusively so! Keeping in mind that my sample size is still limited, so far the highest “Benin/Togo” scores (>80%) have been obtained for persons with a Gbe speaking background. For one Ewe person from Ghana it was even as high as 97%! To be sure this does not mean that “Benin/Togo” is an indicator of actual Gbe or Ewe descent! 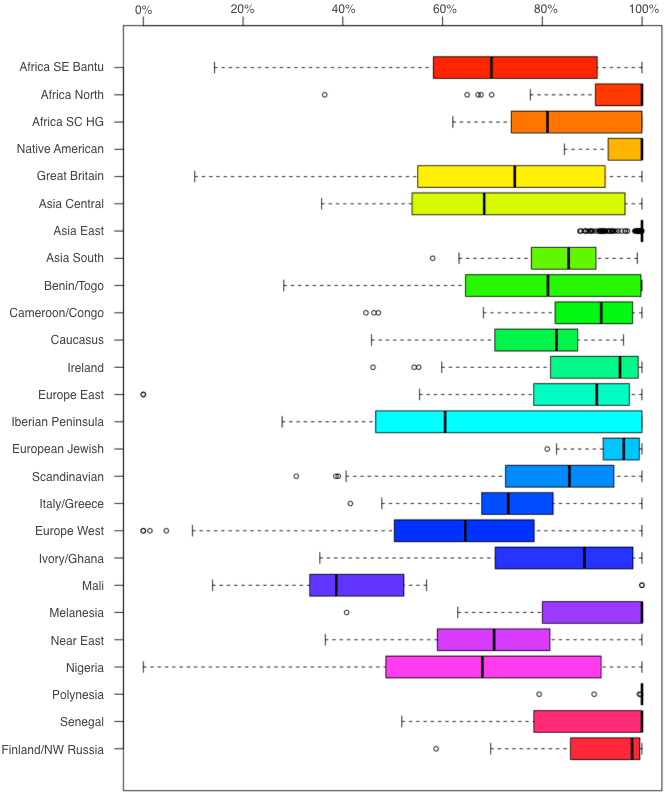 Other ethnic backgrounds might still be perfectly compatible with high “Benin/Togo” scores. 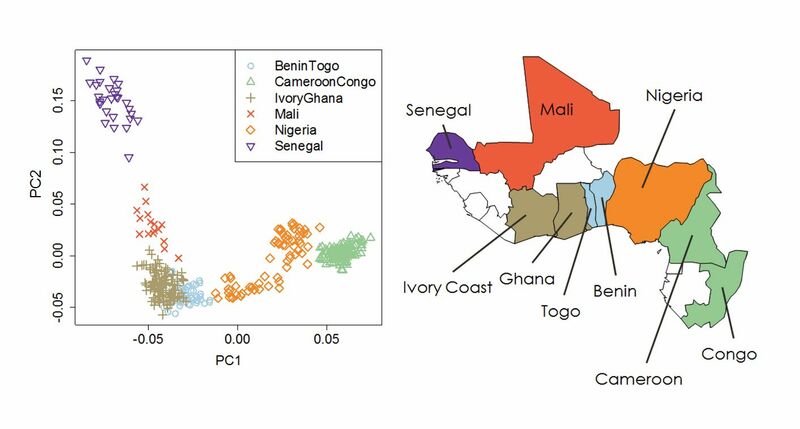 However this finding does seem to suggest that AncestryDNA is using samples taken from Gbe-speaking populations to calculate their so-called “Benin/Togo” estimates. Knowing the history (ca. 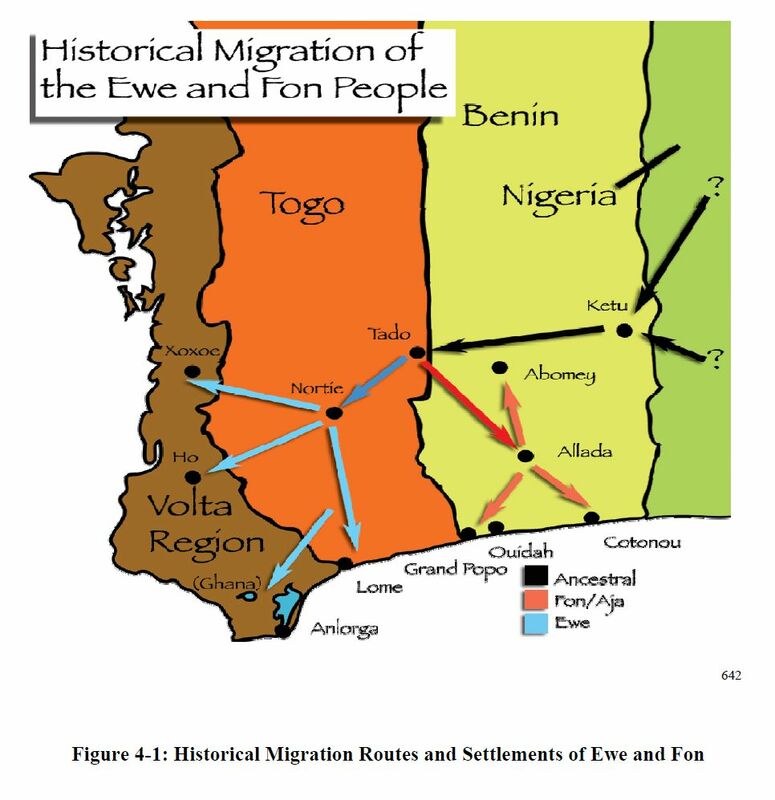 1000-1500 AD) of the Gbe migrations (see map 3.3), originating in southern Nigeria and spreading westwards across Benin & Togo into eastern Ghana, is crucial to gain deeper understanding. And also just being aware that West African ethnic groups are often spread across borders and share a great degree of ancient origins with neighbouring groups is essential. Either way I imagine this finding could really be an eye-opener for many people looking to interpret their so-called “Benin/Togo” results. It puts the reporting of so-called “Benin/Togo” scores into much better perspective. Both for Ghanaians and (southern) Nigerians, but also for Afro-Diasporans (see section 5 for implications). I like to underline that so-called “Benin/Togo” is not an exclusive marker for any given ethnic group or nationality. Both according to Ancestry’s own info (see map 3.2) as well as my survey findings it could be suggestive of many different ethnic origins from eastern Ghana into southern Nigeria, while possibly also some ethnic groups further west such as the Gur speaking people in Burkina Faso and northern Ivory Coast might score substantial amounts for this region as well. This geographical range ultimately to be explained mostly by shared ancient origins from Nigeria rather than from Benin or Togo. AncestryDNA regions correlating with language? The so-called “Senegal” and “Mali” regions correspond mainly with the distribution of Atlantic and Mandé languages. All concentrated within the area which is also known as Upper Guinea. 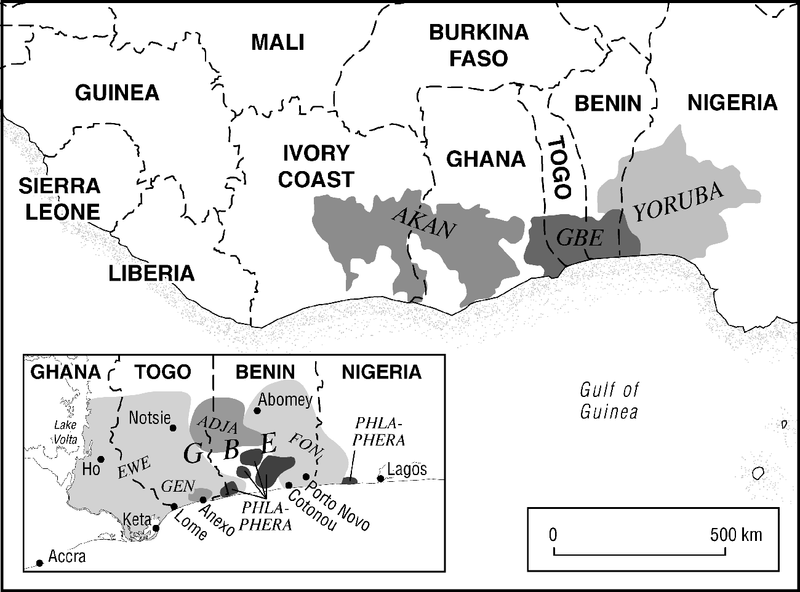 The so-called “Ivory Coast/Ghana” region seems to coincide mostly with the area where both Kwa and Kru languages are spoken. 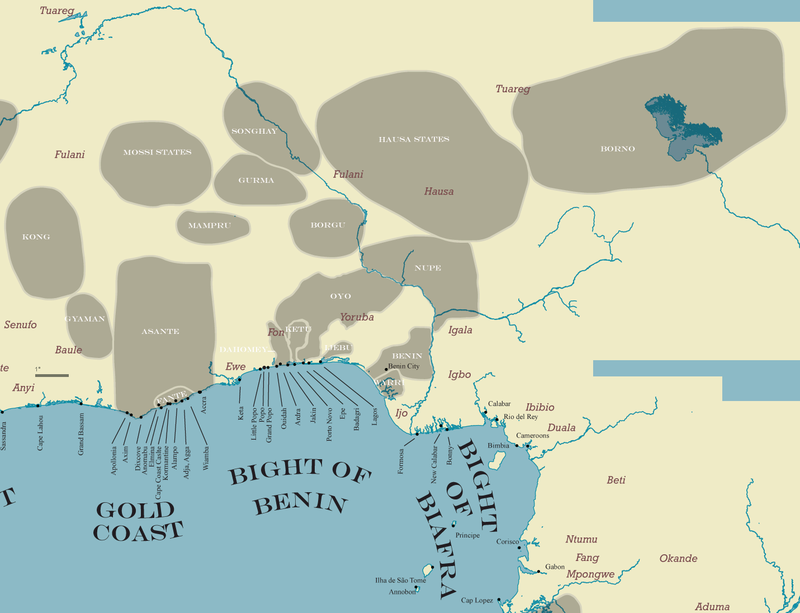 So-called “Benin/Togo” seems to be associated first of all with the Volta-Niger languages (which includes both Gbe languages and Yoruba as well as Igbo). So-called “Nigeria” would in fact also be including Volta-Niger languages. Creating major overlap, even when shifted more eastwards. But in addition it’s probably also covering all other major language groups native to presentday Nigeria (incl. also Chadic speaking Hausa’s, not shown in the map but based on my Nigerian survey findings). 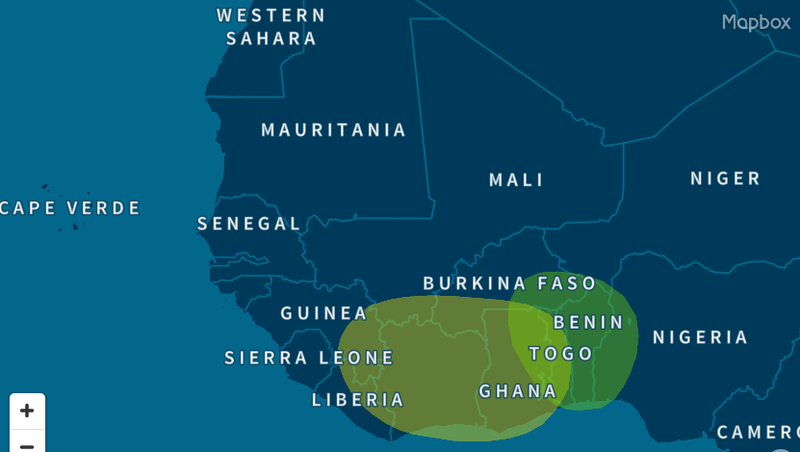 These last three AncestryDNA regions (“Ivory Coast/Ghana”, “Benin/Togo” and “Nigeria”) together more or less envelop the so-called Lower Guinea area. 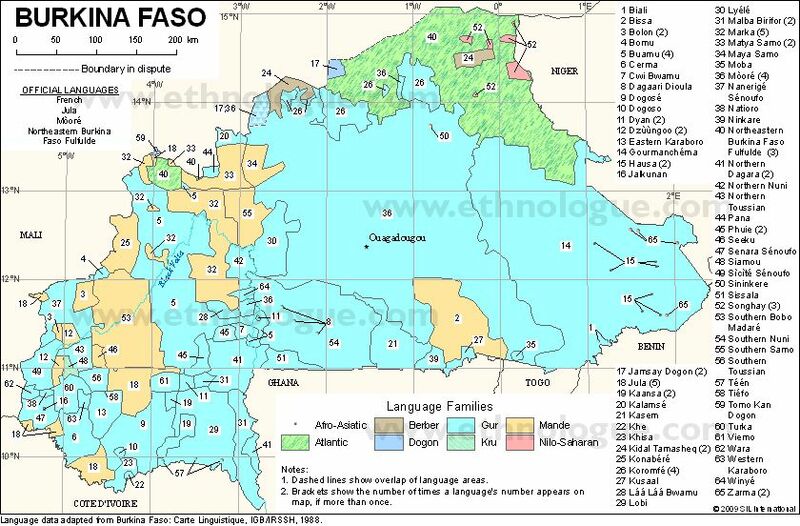 Presently AncestryDNA does not have any separate region for Burkina Faso (which is mostly Gur speaking, see this map). The Gur languages are therefore probably being covered by a mixture of “Ivory Coast/Ghana” with “Mali” and “Benin/Togo”. So-called “Cameroon/Congo” is a bit out of scope because it is principally linked to the Bantu languages (shown in blue) from Central & Southern Africa. But it also connects with the closely related Bantoid languages within the border area of Cameroon & Nigeria which gave rise to the Bantu expansion. Source. Notice how the old grouping of Kwa languages used to extend from southern Nigeria into southeastern Ivory Coast. Also notice the presence of Kru languages in both Liberia & Ivory Coast. Source. Notice how all 3 language groups are practically adjacent and crossing modernday country borders. 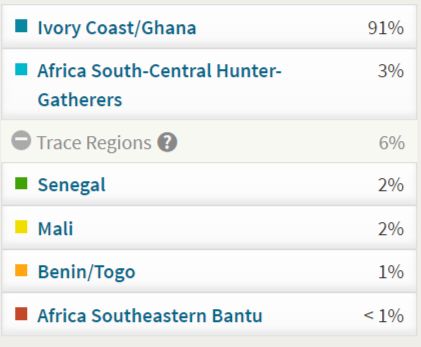 From Ancestry’s information (see this plot) it can be gleaned that the “Benin/Togo” and “Ivory Coast/Ghana” regions cluster the closest from all other African regions on AncestryDNA. And furthermore the samples from Benin/Togo and Ivory Coast/Ghana are the only ones that seem to overlap to some degree. From my Nigerian survey findings it has come to light that the “Benin/Togo” region is very commonly reported for southern Nigerians as well. Although usually as a secondary region. Less frequently and with lesser amounts “Ivory Coast/Ghana” is still also present among several Nigerian results. Suggesting that people in this broader area (Lower Guinea) are genetically speaking quite closely interrelated. Nonetheless it has turned out that if you resist from taking the country name labeling too literally these regions do seem to describe rather distinctive and separate genetic clusters, albeit loosely defined. “Ivory Coast/Ghana” to be associated mostly with Akan & Kru affiliations but possibly also indicative of south Mandé connections. While “Benin/Togo” is more so centred on Gbe affiliations, as well as southern Nigeria where the Gbe originated and still share a great deal of DNA. Together this would encompass the Volta-Niger language group. 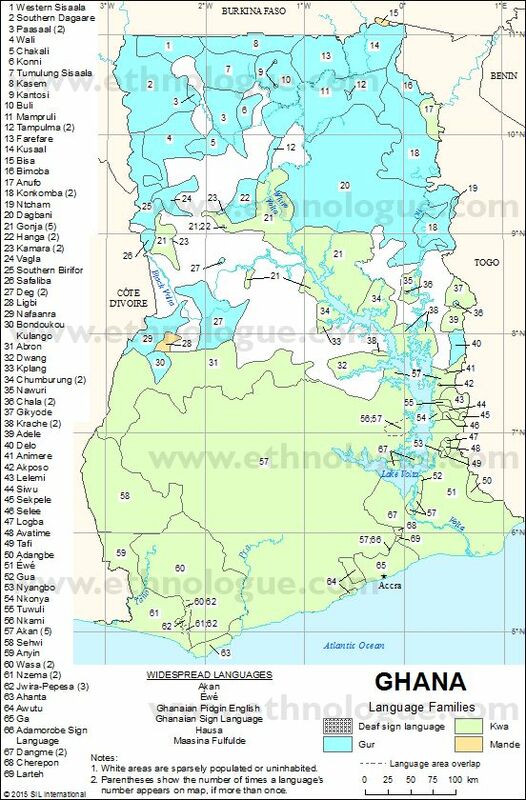 Looking into maps 3.5 & 3.6 above it’s instructive to grasp how the Gbe languages of Ewe (Ghana/Togo) and Fon (Benin) are grouped together with southern Nigerian languages into one Kwa cluster. Nowadays also termed “Volta-Niger“, but formerly also known as eastern Kwa! It is even more illuminating to be aware that also the Kru languages from Ivory Coast and Liberia once used to be classified as Kwa (see this map)! Nowadays a finer distinction is being made and an independent or intermediate position with the Gur languages is often assumed (see this article for an overview). Still this doesn’t take away from the overall close relationships and a hypothetical ultimate origin from Nigeria. Aside from the well known and relatively recent Gbe migrations, this might otherwise be traceable to thousands of years ago rather than hundreds of years ago. Principally driven by the initial spread of agriculture throughout West Africa. And not to be confused with the more recent & convoluted split-migrations taking place in historical time periods. In particular the expansion of the Akan people as well as the southward drift of Mandé people in the past millennium. Apparently causing the Kru populations to migrate further into Liberia, coming in from presentday Ivory Coast. As mentioned by AncestryDNA its so-called “ethnicity estimates” might also reflect ancient migrations taking place “thousands of years ago”. This is often overlooked by people when contemplating their results. However it then of course becomes very useful to consider the current state of knowledge in regards to the earliest peopling of West Africa. Obviously this is a very complex subject and much is yet to be uncovered. Naturally I am also not claiming to be any “expert” as my own reading in this field is still limited. Therefore I will only touch on some key aspects. The quote above is taken from a rather old source and uses an outdated definition of the Kwa language group. The article itself as well as its author however remain influential and widely read. Therefore I suspect that these statements might still be essentially valid. The spread of agriculture across West Africa and its possible linkage with population migrations is not fully known in all its details yet. However it seems not farfetched to assume that especially the so-called Nok culture (within modernday Nigeria) played a pivotal role in this process. The main driving forces behind ancient West African migrations are displayed in map 3.7. Basically two major centres of dispersal are identified, one located in modernday Nigeria and to be associated with yam cultivation and Kwa/Benue-Congo languages (the Volta-Niger grouping had yet not been proposed at that time). The other centre possibly located in modernday Mali and associated with African rice and (proto-)Mandé speakers (see this article). Migrations may have first went along the savannah corridor and only in more recent times also a southwards movement into the rainforest zone. Interestingly the Ivory Coast & Liberia seem to be exactly at the point where these two major forces meet up! Right at the intersection of so-called Lower and Upper Guinea. It might also be very insightful to know if the so-called Dahomey gap (a southern savannah enclave breaking up the West African rainforest zone) possibly played a facilitating role in these migrations taking place in the last 4 or 5 millennia. 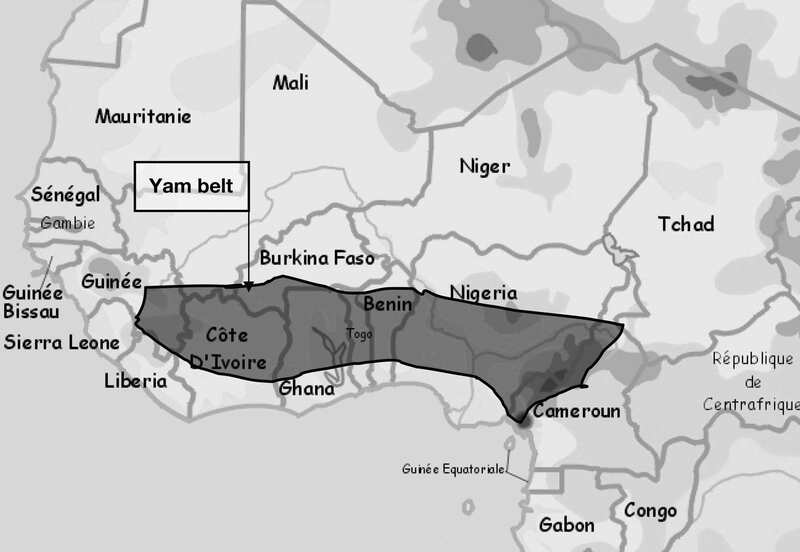 Map 3.8 is showing the so-called Yam Belt in West Africa (see this page for a similar map). 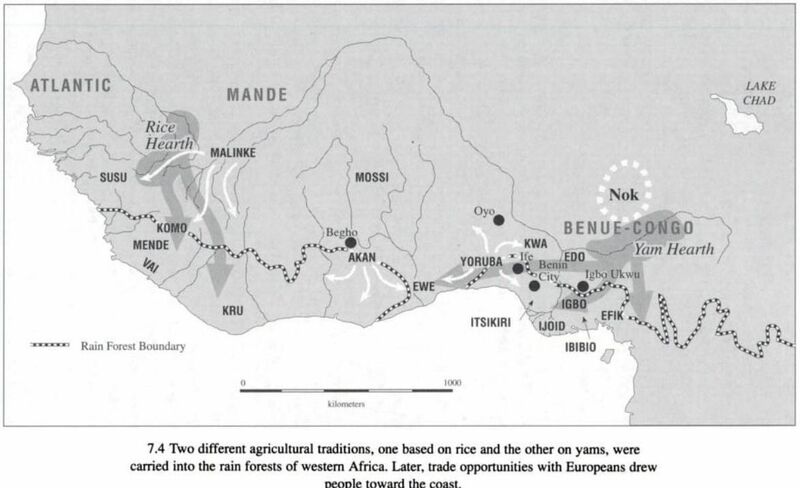 I am inclined to think that the modern-day distribution of yam cultivation could still be roughly correlated with ancient migrations within West Africa. The three world’s biggest producers are Nigeria, Ghana and Ivory Coast. Followed closely by Benin & Togo (see this article). I find it striking that this so-called Yam Belt conforms to a great part with the so-called Lower Guinea area. 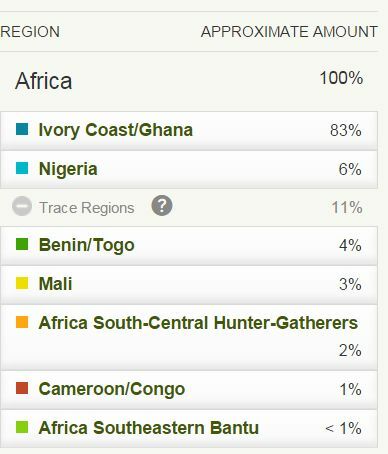 Which in my survey so far seems to be genetically defined by the interrelated regions of “Ivory Coast/Ghana”, “Benin/Togo” and “Nigeria”. It is also very fascinating to learn about the cultural significance of Yam festivals in both Nigeria, Ghana and the Ivory Coast. Even so, obviously also ecological circumstances play a significant role in the current production of yam. And more recent historical developments as well as cultural borrowing might have altered things. For example nowadays West African populations tend to have several staple foods, incl. crops originally imported from the Americas (cassave & maize). And actually yams are also grown all the way west in Cape Verde where it still retains its original Senegambian pronounciation: inhame. Possibly derived from the Wolof verb to eat: nyami. This original form of the word yam is in fact widespread in creole or patois languages across the Afro-Diaspora in the Americas (see this article). Adding an enticing twist to this culinary saga! Summarizing it can be said that my reasoning in this section may have been speculative in some aspects but it is still grounded in phenomena which are more or less verifiable. It might offer more clarification for my West African survey findings featured on this page. Furthermore it could explain the at first sight surprisingly frequent reporting of “Benin/Togo” and to a lesser degree also “Ivory Coast/Ghana” scores among Nigerians. These could then be regarded as merely mislabeled ancestral elements native to the Nigerian genepool. In population genetics it is often the source populations which are assumed to display the greatest degree of diversity, the offshoots being a subset of this variety due to founder-effect. Many people are still getting blindsided by AncestryDNA’s modern country name labeling. In order to get more added value from your results I find it essential to fully realize the interrelatedness of West African genetics due to ancient migrations! 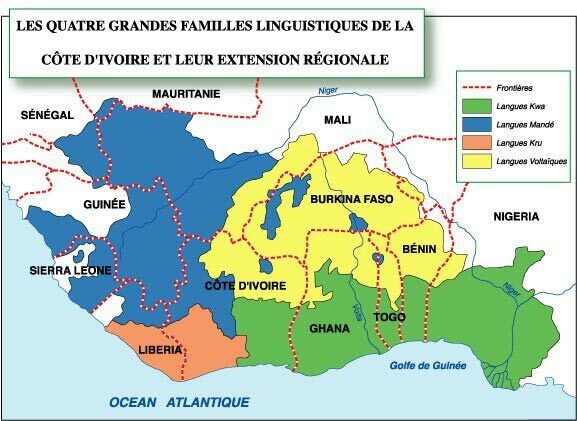 Currentday language families in West Africa are suggestive of these migrations but not perfectly so due to language replacement and the other reservations pointed out already above. The same goes for the distribution of Africa’s traditional native crops (yam, African rice but also Sahelian pearl millet) which again appears to be indicative for ancient West African migration patterns but understandably not correlating for the full 100%. Unfortunately this highly fascinating topic of early West African (pre-)history is often absent or poorly represented in the curricula of primary and secondary education. Furthermore both scholars and laymen tend to pay more attention to other areas of Africa. In particular North/East Africa because of early human evolution or Ancient Egypt as well as Central/Southern Africa in regards to the Bantu expansion. Regrettably this relative neglect of West African orientated research has lead to a severe lack of basic knowledge among the general public. Leaving them vulnerable to serious misinterpretation and even at risk of being mislead by agenda-driven fringe movements. It is a true shame that West African (pre-)history too often is forcibly linked to other faraway places simply for prestige reasons or misguided ideology. This is not to deny that West Africa has indeed been in long standing mutual contact with neighbouring parts of Africa. And these connections are certainly also research worthy. Then again so much insight is to be gained when you consider West Africa to be a regional unit within its own right and on its own terms. With its own independent historical driving forces centered principally in modern-day Mali and modern-day Nigeria along the Niger river valley, the true bearer of civilization for West Africa in so many ways. As far as I was able to verify all of the following screenshots below are from persons with four grandparents from said nationality, unless specified otherwise. But naturally I did not have absolute certainty in all cases. Practically all results have been collected by me from public websites or social media.2 I like to thank all my survey participants for having tested on AncestryDNA and sharing their results online so that it may benefit other people as well! While reviewing the more detailed statistics I calculated for my Ghanaian sample group in chart 4.1, keep in mind that averages tend to hide underlying variation. It’s always advisable to also take into account other measures such as the median and especially the minimum & maximum values to get a sense of the range of the scores. Naturally also the sample size (mentioned in the row labeled “Number”) is essential to place this data in better perspective. And even more so actual ethnic background as demonstrated by my separate data for the few Akan and Ewe results in my survey! I will be posting these Ghanaian results grouped according to known ethnic background and ranked according to main regional score. Despite the obviously limited number of samples an insightful pattern seems to arise already. As expected “Ivory Coast/Ghana” peaks among my Akan samples. But this is not an actual confirmation of Akan lineage! The highest “Ivory Coast/Ghana” amount I have seen reported for an Akan person is 97% (twice). However a Liberian of possibly Kru descent scored the exact same amount! Also a Ga-Adangbe person reached an amount of 92% “Ivory Coast/Ghana”. So it pays to be cautious and resist jumping to conclusions! As discussed in section 3 it seems likely that one part of the samples being used by Ancestry to determine their “Ivory Coast/Ghana” estimates are Brong, an Akan subgroup. Hence the strong genetic similarity detected with Akan persons so far, in particular those of Ashanti descent. For other ethnic groups in Ghana a greater variation can be expected. 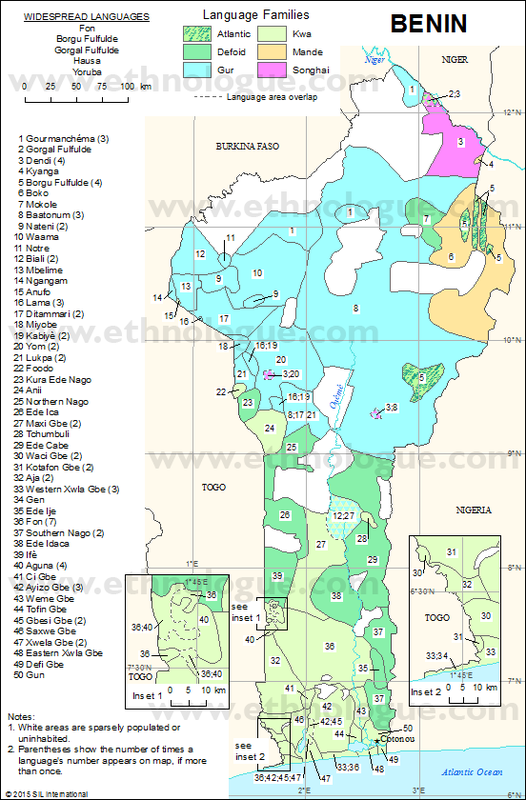 This does not only involve the Ewe & Ga-Adangbe from the southeast but also other ethnic groups from further north. 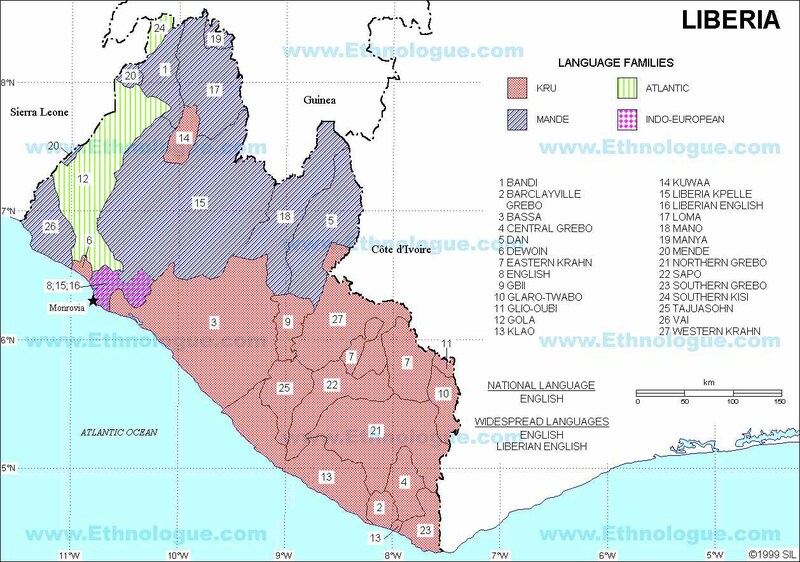 Map 4.1 shows the main ethnolinguistic groups living in Ghana. For even greater detail you may also want to consult this one. The so-called “Ivory Coast/Ghana” region is capable of providing very accurate predictions of Akan ancestry. This is convincingly demonstrated in the screenshot above and also the following ones. Such a predominant score for just one single region is quite uncommon from what I have observed so far, even among African results. This person of Akan background is being described as practically 100% “Ivory Coast/Ghana” if you ignore the miniscule trace regions. Which is just what you would expect, even when such genetic statements are usually more complicated. In this case it was probably a near perfect match to AncestryDNA’s samples from Ghana which led to this outcome. Interestingly a considerable “Mali” score appearing above trace level for this person of partial Brong descent. However so far such scores have been uncommon for my Akan survey participants. I have no complete certainty about this person’s background so I suppose that actual distant Nigerian lineage (going back 3 or 4 generations) could indeed be a possibility. As suggested by the 9% “Nigeria” amount. Especially Hausa and Yoruba migrations into Ghana are known to have taken place already long before its independence in 1957. However I suppose it might also simply indicate genetic similarity caused by ancient migrations and shared origins across Lower Guinea. This is one of only two results with a Fante background in my survey so far. It was only confirmed for one side though so possibly this person’s other parent is of another background. Explaining perhaps the increase in “Benin/Togo”. But who knows perhaps also persons of fully Fante background might get described this way. Afterall their southern location might imply some genetical differentiation when compared with Akan speakers from further north, such as the Ashanti and Brong. A very similar breakdown as the previous one. But this time the ethnically mixed background was confirmed to me. As will be seen further below the increased “Benin/Togo” amount is very likely correlated with this person’s partial Ewe lineage. This breakdown could easily be mistaken for one of the results I have seen so far for people of fully Akan descent. But still this person is aware of atleast one Gur speaking (Frafra) grandparent from Bolgatanga, all the way north. Otherwise one parent selfidentifes as Ashanti and another grandparent would be Fante. Interestingly the so-called “Mali” amount is hardly detectable beyond a slight trace amount. Eventhough belonging to an ethnically mixed person this breakdown is still showing a very convincing “Ivory Coast/Ghana” score. Based on their geographical location as well as their language not being categorized as Gbe it might already be assumed that generally speaking the Ga-Adangbe will be genetically close to the Akan. However given their internal sub-groups and possible inter-ethnic unions from several generations ago with the neighbouring Ewe people undoubtedly there will be greater variation. This insightful breakdown provides proof that high “Ivory Coast/Ghana” scores are not exclusive to Akan results. Also interesting to see the 6% “Nigeria” showing up. Even when several scenarios might apply, it’s still intriguing to know that the Ga people (similar to the Ewe) have oral traditions about migrating from southern Nigeria in the last millennium when the famous Benin empire was expanding. The DNA results for this person and the two following Ga-Adangbe persons have been enabled by the very laudable “African Royal DNA Project”. Again very insightful breakdown as it features the highest so-called “Mali” amount reported for a Ghanaian in my survey so far. Several possible explanations might apply. It will be interesting to see how typical such a score might be with the addition of more Ga-Adangbe results in my survey. Very educational to see these results which look quite different from the two directly above. Highlighting the variation among Ga-Adangbe people. The Krobo being a sub-group which is well known for its cultural traditions. In accordance with the elevated level of “Benin/Togo” shown below one of their probable source of origin is stated to be Sameh in either Benin or Nigeria. The screenshot below features one of the most evenly divided breakdowns in my Ghanaian survey. With no less than 4 main regions being mentioned, very atypical up to now. Usually the top 2 regions combined are clearly predominant for Ghanaians (>90%). 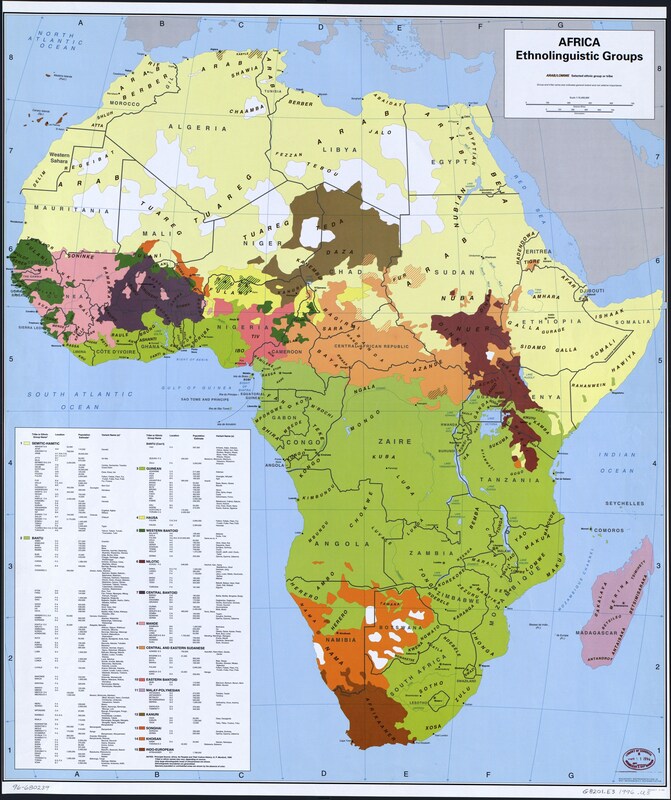 This higher regional concentration being a key aspect to distinguish native African results from those of the Afro-Diaspora, generally speaking (see this overview). 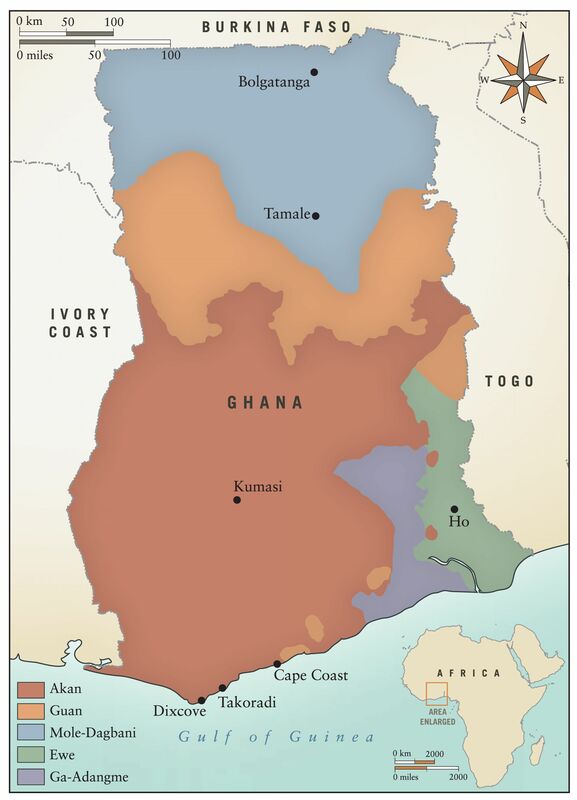 Evenso all 4 main regions are still plausible for the Ghanaian context. 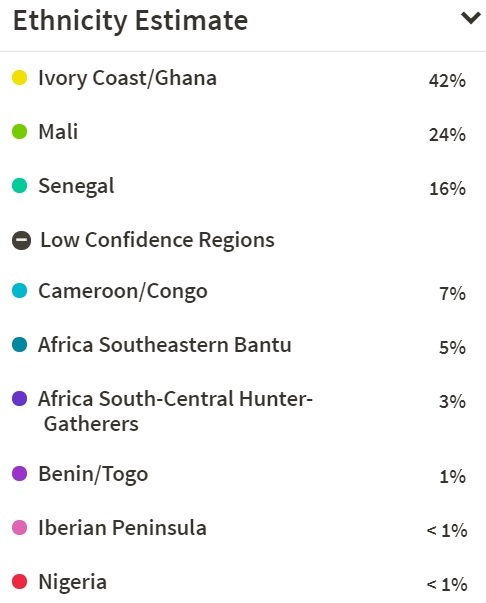 Intriguingly these results belong to a person with confirmed origins from northern Ghana. One parent self-identifying as Chamba which is a subgroup of the Konkomba people who are Gur speakers. They have a highly interesting history as it is said they are among the oldest known inhabitants of northern Ghana. Unfortunately their past also includes recurrent conflict with neighbouring ethnic groups. For Afro-descendants in the Americas it is extremely useful to be aware that “Chamba” was also a frequently used ethnonym for enslaved captives in the West Indies! Also noteworthy is that this person’s family is Hausa-speaking. Actually Hausa is a commonly used lingua franca in northern Ghana, due to its trading diaspora. So actual Hausa descent is not required to be a Hausa speaker in Ghana. But still given the rather elevated “”Nigeria” amount (the highest score in my survey so far) it could be indicative of genuine Hausa lineage I suppose. I was kindly granted access to this person’s DNA matches. And by using my filtering tutorial I was able to find at least 2 matches who seem to be from northern Nigeria (both family names & ethnic regions being plausible). Nothing conclusive as actually the geneflow might also be the other way around, but still a very neat finding! This person of confirmed Ewe background on all lines is being described as practically 100% “Benin/Togo” if you ignore the minuscule Trace regions. It is therefore a very insightful even if perhaps counter-intuitive breakdown for a Ghanaian person. It is by far the highest “Benin/Togo” score I have seen in my survey up till now. 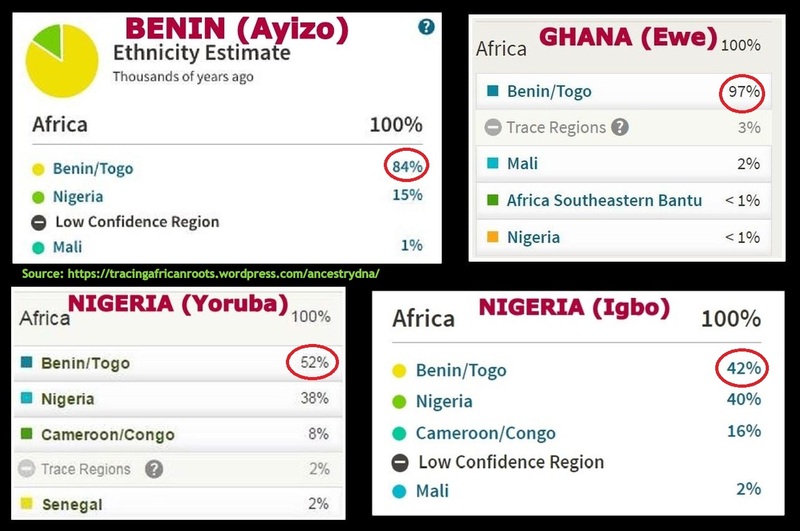 The circumstance that “Benin/Togo” seems to be especially peaking for persons of Ewe background is very much suggestive of Ancestry using Gbe samples to calculate their so-called “Benin/Togo” estimates. Not only from Benin but possibly also including actual Ewe samples from Togo! After all that would explain this nearly perfect match to the samples in Ancestry’s database. Interpreted in such a manner this breakdown is actually very coherent! This outcome also makes for a perfect example to illustrate how the country name labeling by AncestryDNA should not be taken as gospel. Almost all African countries have been colonial creations with borders cutting right through the homelands of ethnic groups. Also very closely related ethnic groups can often be found on both sides of the border. This is indeed the case for the Ewe people and the greater language group of the Gbe they belong to. And especially Togo has very artificially drawn borders. The split-up of Eweland being caused by the takeover of formerly German held colony of Togoland. The results above belong to a person who self-identifies as being Ewe. It appears therefore that the “Benin/Togo” amount will show some significant variance for Ewe results (97%-72%-46%), perhaps correlating with deeper ancestry or also with more recent inter-ethnic unions from only a few generations ago. I will need more Ewe survey participants to confirm. But it can already be said that 9% “Cameroon/Congo” does seem very atypical. It is not showing up as a low confidence region. Which increases the odds that this is a genuine finding of probably Central African DNA! I have yet to see such a relatively high amount being reported for Ghanaians or other West Africans, with the exception of Nigerians but in their case it’s plausible given that Cameroon is their neighbouring country. Almost 50/50 breakdown with “Benin/Togo” surpassing “Ivory Coast/Ghana” but not by that much. Seems like a fitting outcome for this person with both Ewe and Akan lineage. So far I have not yet seen many results from Benin. This is most likely because migrants from Benin are quite uncommon in the US or the UK. And therefore they will appear less frequently within AncestryDNA’s cusomer database than for example Nigerians or Ghanaians. 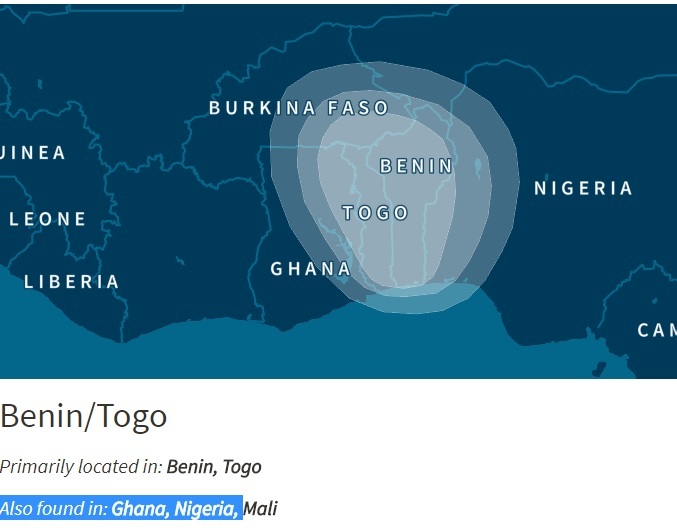 Nevertheless going by Ancestry’s own information as well as the two results shown below, the so-called “Benin/Togo” is indeed quite predictive of genuine Beninese DNA. Still also minor but considerable scores of “Nigeria” as well as “Ivory Coast/Ghana” are on display. As discussed in section 3 it seems likely that the samples being used by Ancestry to determine any “Benin/Togo” score are from either southern Benin or southern Togo and belong to a Gbe (Kwa) speaking subgroup. For other ethnic groups (non-Gbe) in Benin a greater variation can be expected. For some groups “Benin/Togo” might then actually only be secondary or even very minor when compared with more prominent scores for either “Nigeria” (Yoruba), “Mali” (Bariba and other Gur-speaking) or even “Senegal” (Fula/Fulfulde). 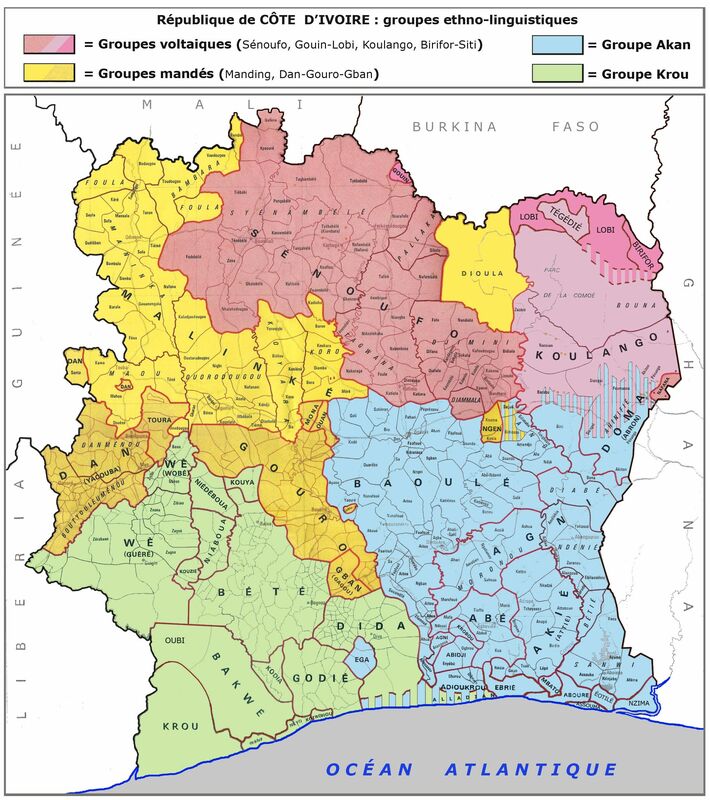 Map 4.2 shows the main ethnic groups living in Benin. Or see also this one which is even more detailed. Both of these results belong to persons who are from the Ayizo People of Dahomey Kingdom in Allada, Benin. They were made available by the praiseworthy efforts of the African Royal DNA project. A true blessing because as already described above it doesn’t seem likely many other DNA testers from Benin will be forthcoming. Even when Benin holds a tremendous significance for the Afro-Diaspora. Overall speaking these two results seem perfectly in line with their known backgrounds. The Ayizo language belonging to the Gbe language group, just like Ewe and Fon. 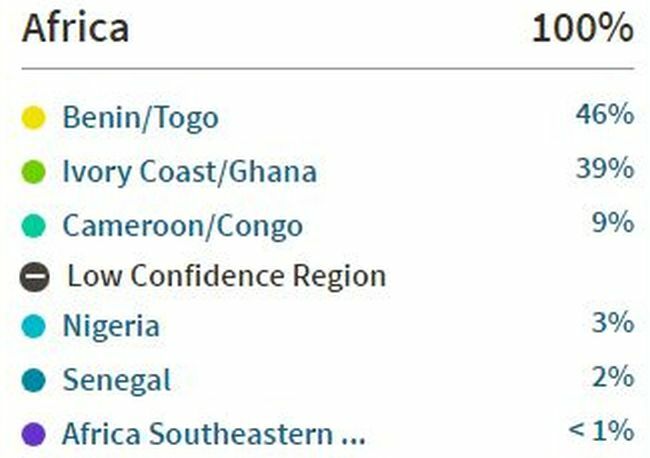 The minor regional scores for so-called “Ivory Coast/Ghana” and “Nigeria” being consistent with inevitable genetic overlap. However it might be educational to indulge in some speculation concerning the seemingly Central African trace regions (4% “Cameroon/Congo” and 3% “Southeastern Bantu”) shown in the second screenshot. They could very well just be a mere misreading of DNA patches which Ancestry finds hard to classify (hence “low confidence”!). So it might not be relevant for the person in question. 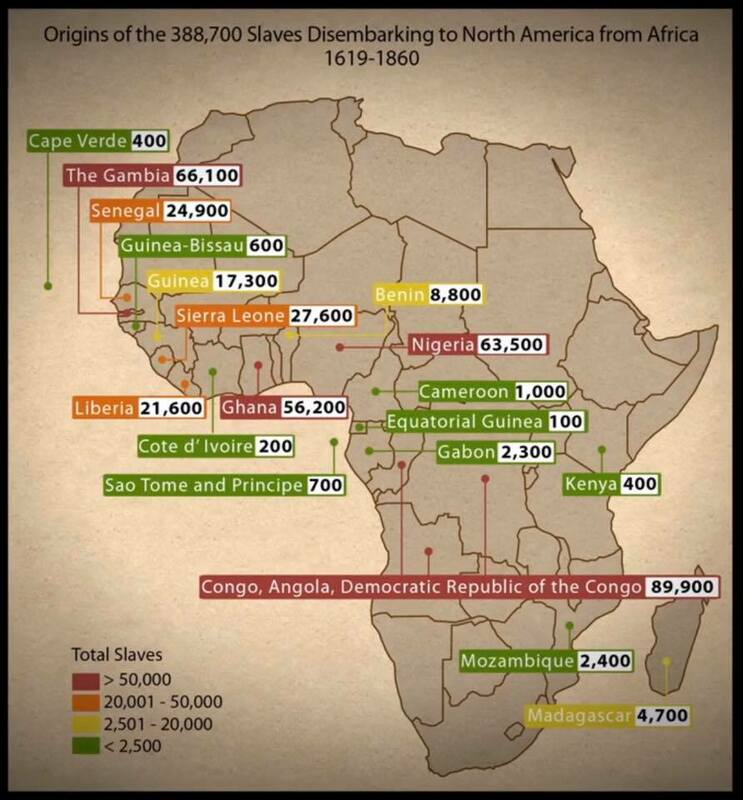 But generally speaking I suppose such amounts could also *possibly* be explained by distant Aguda ancestry: formerly enslaved Afro-Brazilians who returned to West Africa in the 1800’s. Adding an intriguing but complicating twist when wanting to interpret DNA results from southern Benin. But also in fact Togo, Ghana and Nigeria. While reviewing the more detailed statistics I calculated for my Liberian sample group in chart 4.2, keep in mind that averages tend to hide underlying variation. It’s always advisable to also take into account other measures such as the median and especially the minimum & maximum values to get a sense of the range of the scores. Naturally also the sample size (mentioned in the row labeled “Number”) is essential to place this data in better perspective. And even more so actual ethnic background! 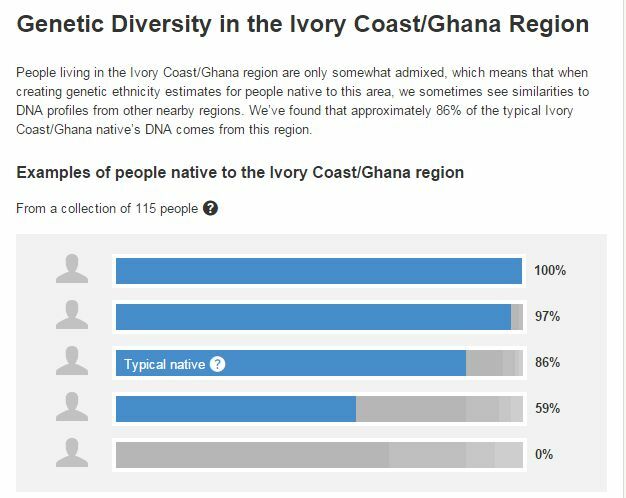 So far “Ivory Coast/Ghana” is the most characteristical AncestryDNA region appearing for Liberians generally speaking and usually also convincingly so (see median score). However this is almost always combined with other main regions showing up. In particular “Senegal”, “Mali”, and “South-Central Hunter-Gatherers”. “Senegal ” being the most important secondary region so far. It should be kept in mind that none of these regions are confined to their AncestryDNA labeling. I have ranked these Liberian results based on the amount of highest to lowest score for “Ivory Coast/Ghana”. And despite the obviously limited number of samples an insightful pattern seems to arise already: “Ivory Coast/Ghana” peaks among Liberians with a Kru background. But it is not an actual confirmation of Kru lineage! A complicating factor in my Liberian survey so far is that most of my survey participants have a mixed ethnic background (within Liberia). 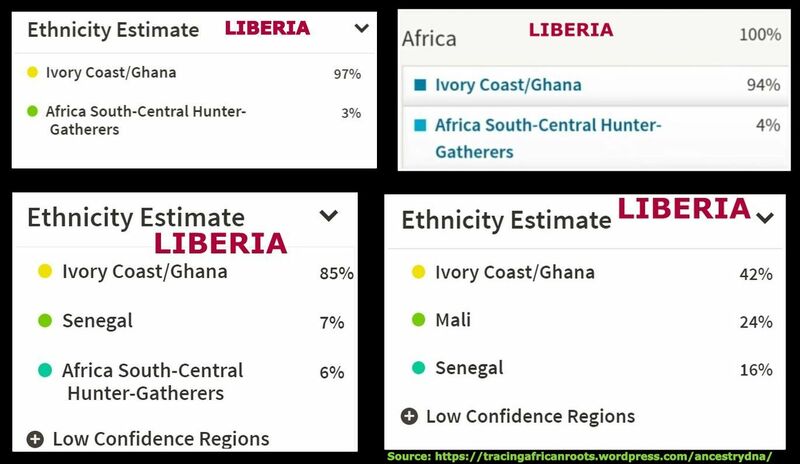 I will need to receive more results of Liberians with just one single ethnic background (at least for all 4 grandparents) to get a clearer picture. The highest “Ivory Coast/Ghana” amount I have seen reported for a confirmed Kru (Grebo) person is 94%. But I strongly suspect that an even higher score of 97% also belongs to a person of Kru descent. This would be equal to the highest “Ivory Coast/Ghana” score I have observed so far for Ghanaians (Akan). A shocking outcome perhaps for people who still take the country name labeling on AncestryDNA too literally 😉 But it actually does make sense if you are aware of the full context. As discussed in section 3 it seems reasonable to assume that Ancestry not only uses Brong samples from Ghana to determine their “Ivory Coast/Ghana” estimates. But in addition it might also be using both Kru samples and southern Mandé samples from Ivory Coast. Both of these language groups are also represented by closely related ethnic groups in Liberia! So this could very well explain the strong genetic similarity detected with especially Liberian Kru persons so far. Furthermore it might also be the reason for the still relatively high “Ivory Coast/Ghana” scores being reported for people of southwest Mandé background in Liberia, such as the Kpelle and the Dan/Gio. Again I will need more (unmixed) samples to confirm though. Despite the perhaps confusing labeling the so-called “Ivory Coast/Ghana” region seems to be strongly corresponding with Liberian ancestry. At least for Liberians themselves. This is convincingly demonstrated in the screenshot above and also the following ones. Such predominant scores for just one single region (>90%) are quite uncommon from what I have observed so far, even among African results. Suggesting a near perfect match to the samples contained in Ancestry’s Reference Panel, which are being used to calculate their “Ivory Coast/Ghana” estimates. A fully 100% amount could have been achieved had it not been for the 3% “South-Central Hunter-Gatherers” score. As will be seen in the following screenshots such minor but still clearly detectable amounts are very consistent and typical for Liberian results in my survey. Because the person behind these results was adopted I regrettably do not have any further details about her background. However I suspect that she could very well be Kru and in particular Krahn, as they may have been the most relatively numerous among the refugees of the immensely tragic Liberian civil war. 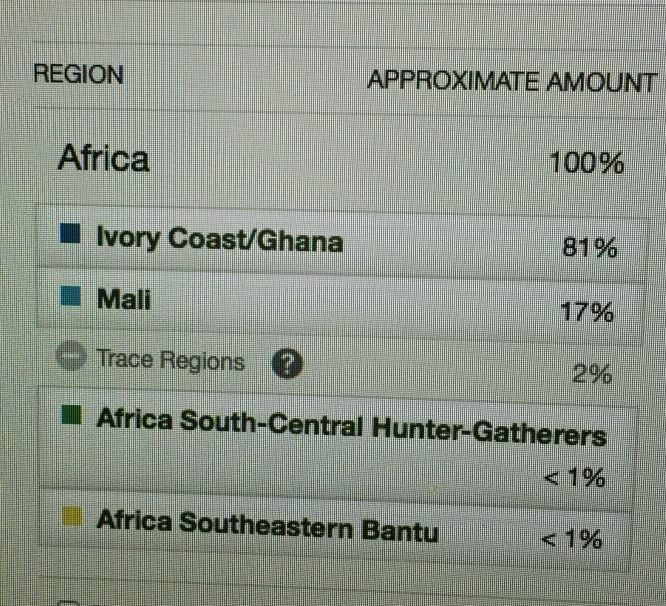 Either way it is very telling that both a Liberian and a Ghanaian person obtained a 97% “Ivory Coast/Ghana” score. As this is bound to have implications for how Afro-Diasporans should interpret their own so-called “Ivory/Coast/Ghana” scores. I will provide more details in the next section. However right now it might already be useful to point out that this person is part of the so-called “African Caribbean” genetic community (labeled as “migrations”) based on a shared genetic affiliation for “Ivory Coast/Ghana”. I was kindly given permission to view this person’s DNA matches and she has no less than 1,540 matches (30 pages)! Practically all of them either African Americans, Hispanics or West Indians. These results belong to a woman of confirmed Kru descent. Her testresults are also shown in a great Youtube video. It can be seen further below in the video section or by following this link. The remaining amount not shown in the screenshot is 2% “Senegal”. I need more results to confirm but such a breakdown might be quite typical for people who are solely of Kru descent. These results belong to a man of a mixed Kru and Kpelle background. His testresults are also shown in a great Youtube video. It can be seen further below in the video section or by following this link. It might be deemed surprising that his partial Mandé lineage (Kpelle) did not result in higher “Mali” and/or “Senegal” amounts. As it is right now they are both merely reported as trace regions of 2%. While “Ivory Coast/Ghana” is shown convincingly as the predominant region. Due to a lacking number of Liberian results to compare with I can only speculate at this moment. However I would venture to say that *possibly* this outcome is caused by an (assumed) inclusion of Ivorian Mandé samples by AncestryDNA. Again I would need to get more confirmation, however it might explain why both this person’s Kru and Mandé side are described as overwhelmingly “Ivory Coast/Ghana”. This breakdown belongs to a person with a rather mixed background. Yet still his primary “Ivory Coast/Ghana” score seems very prominent. Interestingly there is awareness of one distant ancestor (great-grandparent) with repatriated slave heritage, sometimes also known as “Congo” in Liberia. Similar to Sierra Leone also in Liberia many so-called recaptives were brought in for settlement. Apparently because many of these liberated Africans happened to be from slaveships intercepted near the Congo river they were all called “Congo” irrespective of actual provenance. At first a distinction was made between them and the Americo-Liberians, who were rather formerly enslaved persons from the USA. However, over the years the two groups joined and now it seems that the terms “Americo-Liberian” and “Congo” are used interchangeably. Very similar to the formation of the Sierra Leone Krio people. Except that the Liberian term “Congo” seems quite misleading for the much more intricate and varied origins of the Americo-Liberians. During my survey I have been very careful to seek out any clues of Americo-Liberian lineage as understandably this might complicate a proper interpretation given their rather mixed origins. However so far I have not yet included any Liberian with significant Americo-Liberian background. Despite being very influential they have afterall always been a small minority. According to some estimates about 2.5% of the total population. I am merely speculating here but in this case perhaps the 4% “Nigeria” as well as the 2% “Southeastern Bantu” score might be associated with this person’s Americo-Liberian familyline. However only DNA matches might confirm I suppose. This person might yet be of an ethnically mixed background, involving also neighbouring Guinea. But there is no certainty about it. Either way the breakdown seems pretty much in line with those of other Kru persons I have seen up till now. The 6% so-called “South-Central Hunter-Gatherer’s” amount is the highest I have seen so far. Another Liberian received the same score. As mentioned already a possible connection with Liberia’s earliest inhabitants seems very tempting. I should point out that I did not come across any apparent hint of “Congo” lineage for this person, which might theoretically provide another explanation for the elevated 6% “South-Central Hunter-Gatherers” score. This person’s family is from a Mandé speaking ethnicity called either Dan or Gio. They are located in the border area with Ivory Coast and Guinea Conakry (see map 4.3). Interestingly only 17% of his ancestry is designated as “Mali” while “Ivory Coast/Ghana” is clearly prevailing. As mentioned for the half Kpelle result above *possibly* this outcome is caused by an (assumed) inclusion of Ivorian Mandé samples by AncestryDNA. Perhaps these samples might even belong to the same Dan ethnic group, as they are found across the border as well. And apparently an alternate name of theirs is Yacouba! More results from Mandé speaking Liberians and Ivorians are needed to confirm though. Even though the 17% “Mali” score might seem minor, it is still showing up quite strongly when we take into account that 1) a “typical native” of Mali is only 39% “Malian” according to Ancestry (see also AncestryDNA Regions) 2) the Liberian group average for “Mali” is 7.6% (n=12). So eventhough it shows up relatively subdued, “Mali” might yet be a significant ethnic marker for this Liberian person. Still it is also intriguing to speculate what this may imply for the deeper ancestral origins of Mandé speaking groups in Liberia. It is known historically they were last to arrive in Liberia (Atlantic/Mel speaking groups being assumed to have settled first followed by Kru speakers from the east, see also this link). And they might have absorbed many previous inhabitants among their ranks by intermarriage and/or language shift. The Dan/Gio language is being classified as a southeastern Mandé version. Sharing many commonalities with the central and more “classic” Mandé languages but still also separate. Implying different historical and possibly also different genetical trajectories. Again I will need more samples to confirm though. A perhaps hardly noticeable hint but still meaningful could be the trace amount of <1% for “South-Central Hunter-Gatherers”. This is the lowest amount I have observed so far for Liberians and might suggest a minimal intermingling with strictly coastal populations. I have only full confirmation for one side of this person’s family. This person might yet be of an ethnically mixed background, incl. also distant Americo-Liberian. But there is no certainty about it. Either way the breakdown seems pretty much in line with those of other Kru persons I have seen up till now. Except perhaps for the 4% “Southeastern Bantu”. Which is the second-highest such score I have observed so far for Liberians. Regrettably no further details available for this persons background. However all the main regions seem perfectly in line with what I have observed so far. Except that the 6% “South-Central Hunter-Gatherers” is very distinctive. The highest such score for Liberians up till now. Yet again a person of quite mixed origins (within Liberia). 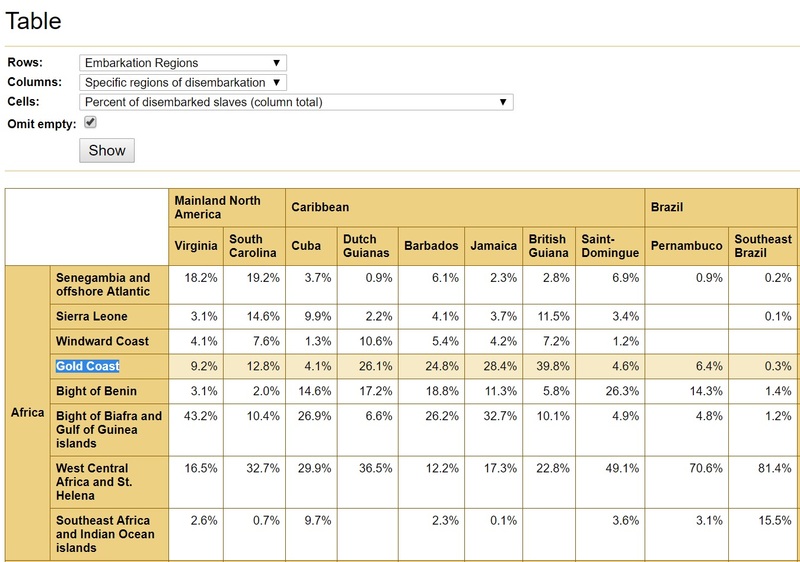 However for the first time we can see how “Ivory Coast/Ghana” can also be relatively low (<50%) for Liberians. Both “Senegal” and “Mali” amounts are above group average. With especially the “Mali” score standing out! It seems very likely that this outcome is correlating with her partial Mandé side (Vai & Gbandi). As her confirmed Kru lineage (Bassa) would only apply for one grandparent. Interestingly unlike the Gbandi language and most other Liberian Mandé languages the Vai language is classified as being similar to the central versions, incl. Manding. It would be very insightful to compare with the results for a person of fully Vai descent. The great-aunts of this person’s grandfather are said to have been formerly enslaved West Indians. This might appear to be quite distant but still would account for a sizeable degree of Americo-Liberian lineage (1/16?). The strikingly elevated scores for “Cameroon/Congo and “Southeastern Bantu” already seem quite suggestive as combined they are the highest such scores I have observed for Liberians. Despite being “low confidence” regions at this increased level the possibility of minor Central African DNA seems quite realistic. Intriguingly the trace amount of European admixture also seems very indicative of such a heritage. It is showing up as <1% so-called “Iberian Peninsula” which in itself is not to be taken too literally. It could be a misreading of other types of western or also southern European DNA. And actually even North African DNA is often described by this category. Which sometimes results in minor scores of this region being reported for Fula people! Given the various possibilities it will be very instructive to have a closer look into the DNA matches. I was kindly granted access to this person’s DNA matches. I first scanned all of them and then I filtered them for both 100% African as well as 100% European profiles (see this tutorial). Amazingly out of a total of 3,372 DNA matches (68 pages!) it seems that she has over 500 European-American matches! Some of them with also quite large shared DNA segments (around 20cM). Now it might be that actually in some cases there might be some hick up in Ancestry’s algorithm and these matches in fact are not 100% European genetically speaking. Sometimes due to privacy settings Ancestry does not display all of the ethnic regions for your matches. Which could imply that it’s them who would have some distant African ancestor rather than the other way around. Still I think the odds are high that she indeed has some distant European ancestor by way of the West Indies. Looking at the African matches, (possibly about 17), most of them seem to be from Liberia as expected. This is going by plausible family names as well as ethnic regions. Also a few matches could be from Sierra Leone and Guinea. Interestingly two profiles might be be partially Senegalese and one match might be Nigerian! Again possibly an indication of distant West Indian lineage. Unfortunately I have no full details about this person’s background. Except that one side of her family would be Kpelle. However just like the previous breakdown again “Ivory Coast/Ghana” is quite subdued while “Mali” and especially “Senegal” are showing up very strongly. Another noteworthy aspect of this breakdown would be the 8% “Cameroon/Congo”, the highest such score I have seen in my Liberian survey. Possibly together withh the 4% “Nigeria” it might be indicative of distant Americo-Liberian ancestry. I can only speculate in regards to the other half of this person’s background but I suspect that another Mandé line could very well be included as well. 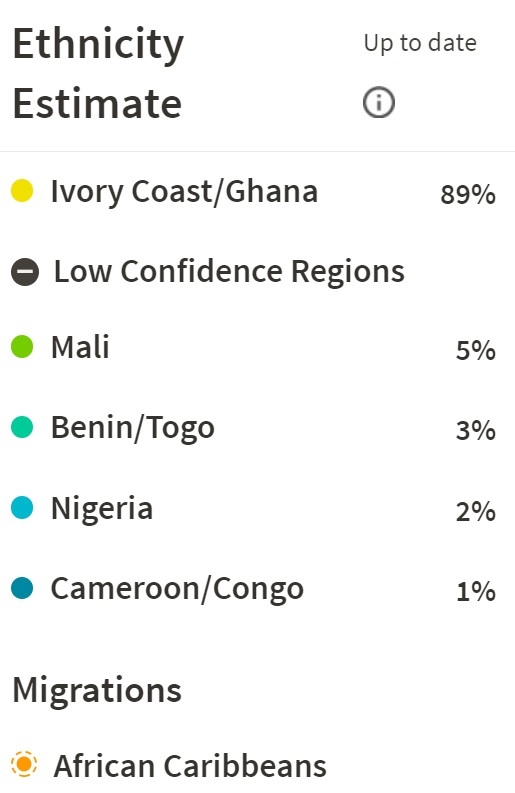 This is the only Liberian result so far to show not “Ivory Coast/Ghana” but rather “Senegal” as primary region. It demonstrates how so-called “Senegal” can be reported in significant amounts as far south as Liberia. Also the “Mali” amount is in fact very impressive and the highest in my Liberian survey so far. Regrettably I have no further details on this persons background beyond that he was adopted from Liberia. Just fom the looks of it such a breakdown might very well also belong to a person from Guinea or Sierra Leone. I have kindly been granted acces to the DNA matches for this person and by applying my filtering tutorial I was able to zoom into possibly 11 African profiles out of a total of 1,146 DNA matches (23 pages). Intriguingly most of his African matches appear to be from either Sierra Leone or Guinea (7x) (going by family names, ethnic regions and 1 time also birth place) rather than from Liberia (3x). One single match might even be a Hausa-Fulani from Nigeria, undoubtedly then related by way of a Fula line. Many ancestral scenario’s could be valid, incl. also being descended from recent migrants from neighbouring countries. But either way it illustrates how both Liberia and Ivory Coast are somewhat intermediate between Lower Guinea and Upper Guinea. While reviewing the more detailed statistics I calculated for my Ivorian sample group in chart 4.3, keep in mind that averages tend to hide underlying variation. It’s always advisable to also take into account other measures such as the median and especially the minimum & maximum values to get a sense of the range of the scores. Naturally also the sample size (mentioned in the row labeled “Number”) is essential to place this data in better perspective. And even more so actual ethnic background! So far I have not yet seen many results from the Ivory Coast. This is most likely because Ivorian migrants are relatively uncommon in the US or the UK. Therefore Ivorians will appear less frequently within AncestryDNA’s cusomer database than for example Liberians or Ghanaians. 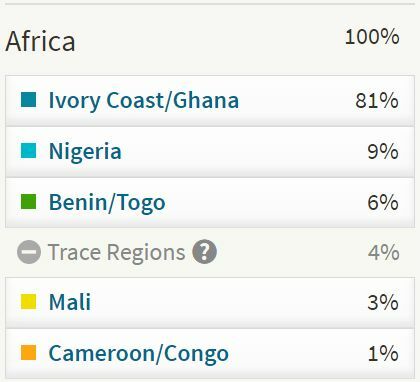 Nevertheless going by Ancestry’s own information as well as the few results so far in my survey, the so-called “Ivory Coast/Ghana” can indeed be quite predictive of genuine Ivorian DNA. However this is almost always combined with other main regions showing up. I should point out though that among my Ivorian survey participants three family members are included (mother & two children) who have distant Krio lineage from Sierra Leone. This possibly explains some of the “Benin/Togo” scores I observed for them. Even when in fact another Ivorian result of Senoufo background showed the highest so-called “Benin/Togo” score. So-called “Mali” is the most important secondary region so far and I suspect this will be maintained also when other Ivorian results will be added to my survey. It should be kept in mind that currently AncestryDNA does not have any separate region to describe Gur speaking affiliations (incl. Senoufo, even when nowadays it’s classified as a separate language group). So any so-called “Mali” score might in fact also be connected rather with Burkina Faso. As discussed in section 3 it seems likely that one part of the samples being used by Ancestry to determine their “Ivory Coast/Ghana” estimates are Brong, an Akan subgroup. While there is a possibility that in addition Ivorian samples were used with a Kru background as well as a southern Mandé background. I have no certainty about this though. If true this sample selection would however already cover 3 out of the 4 main Ivorian language groups (Akan, Kru, Mandé). The notable exception being the Gur/Senoufo as already pointed out above (referred to as “Voltaiques” in map 4.4). Either way, a greater degree of variation is to be expected given the rather complex ethno-linguistic situation of the Ivory Coast. Perhaps correlating mostly with a north-south axis. It will be interesting to see if in addition of “Mali” also substantial “Senegal” scores will be reported for people from the northwest of Ivory Coast. For southern Ivorians it will be fascinating to see if the tendency so far of minor but relatively pronounced so-called “South-Central Hunter-Gatherers” scores will be maintained. My Ivorian survey findings would not have been possible without my Ivorian amie J. 😉 She not only shared very insightful DNA results from herself and her family with me. But in addition she also shared her profound thoughts with me about DNA testing and Côte d’Ivoire’s history, as well as providing useful sources. I was greatly inspired by her in my discussion about the Ivorian samples in Ancestry’s Reference Panel and the ancient migrations taking place in West Africa. So here’s a shout-out en français: J, je te remercie énormément pour ton aide, tu es vraiment géniale! Judging from this 1 individual result the “Ivory Coast/Ghana” category can be very predictive also for someone of Ivorian descent! Undoubtedly this reflects her mostly Akan background. The breakdown mentions 83% for “Ivory Coast/Ghana” but according to the range given it could be as high as 94%. Ancestry performs 40 separate estimates for each region and 83% would be the average of these 40 runs. 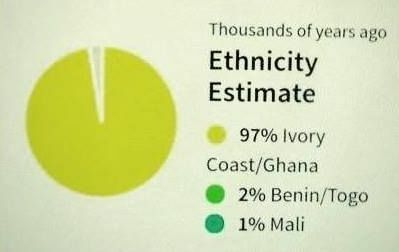 83% is also pretty much the same as the 86% scored by the “typical native” from Ivory Coast/Ghana according to Ancestry. This 86% being the median result of their 99 samples (see AncestryDNA Regions for more details). 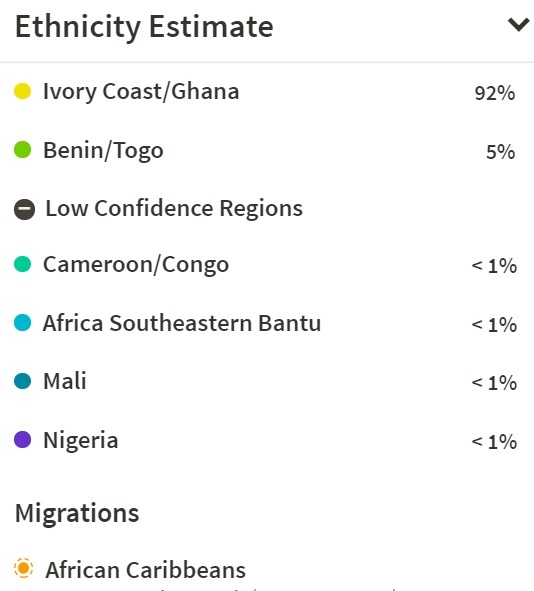 I am also blown away by how the minor “Nigeria” % seems to be pretty much in line even, with her 1 non-Ivorian great grandparent who is Krio, the descendants of ex-slaves from the USA, maroons from Jamaica as well as liberated slaves from all parts of West/Central Africa being settled in Freetown/Sierra Leone. It is known many of them were Yoruba so some minor “Nigeria'” would fit well. Some of the trace regions might also be explained by the very diverse Krio background but it cannot be ruled out that they may actually also be associated with her Akan side, especially the “Mali” score. Despite the low confidence being attached to trace regions the distinctive “South-Central Hunter-Gatherers” score might still be a very meaningful finding. These results belong to the brother of the first Ivorian person I featured above. The results below belong to their mother. It provides a very useful illustration of recombination. Due to the random nature of genetic inheritance her brother ended up with a markedly higher “Mali” proportion than herself (21% vs 3%). Judging by his mother’s results shown below (27% “Mali”) he might have received this part of his DNA firstmost through his maternal side, who is mostly Baule. Although only a comparison with his father’s results could clarify this conclusively. His father being fully Akan Lagunaire/Lagoon (mainly Attie but also Ebrie and Abbey). These results belong to the mother of the two previous persons. She has one grandparent of Krio descent from Sierra Leone/Gambia. Given the possibly ultimate Yoruba lineage involved the 13% “Benin/Togo” and 7% “Nigeria” could very well be reflecting the Krio side of her family tree. Perhaps the 2% “Cameroon/Congo and 2% “South-Central Hunter-Gatherer’s” amounts are to be added as well. As this would complete an approximately 25% genetic inheritance. However judging from the very few Krio results I have seen so far they also tend to score “Ivory Coast/Ghana”, so I suppose it cannot be ruled out that some minor % of this region could also be part of her Krio heritage. Otherwise this person’s results would be reflecting her Baule side. And it seems very noteworthy that a relatively high so-called “Mali” score is obtained. Especially when contrasting with the relatively subdued level of “Mali” scores for my Ghanaian Akan samples so far (2.4% on average, see chart 4.1). The history of Baule migration into presentday Ivory Coast and in particular their relationships with other populations already residing there is quite distinctive when compared with Ghanaian Akan. It might not be too surprising therefore that genetically speaking the Baule can no longer be described in the exact same way as Akan people from Ghana. I will need more Baule samples to confirm any pattern though. I was also given the opportunity to have a closer look into her DNA matches. And by using my filtering tutorial I was able to find some very fascinating West African matches. Out of a total of 901 DNA matches (19 pages) 21 matches are almost certainly West Africans. Very useful to compare with her daughter’s matches. First of all because any shared matches will increase the odds of them not being false positives (IBS) but rather IBD (Identical By Descent). This was indeed the case for nearly all African matches of her daughter which she also received except one from Liberia. Overall speaking however she received notably more matches than her daughter, undoubtedly because of her Krio grandparent. Plus unlike her daughter and son she got assigned to a genetic community for African Caribbeans (renamed into “migrations” after Ancestry’s latest update). Highlighting her closer links to the Afro-Diaspora (as represented by Ancestry’s customers). Interestingly also the African matches were more numerous. Most were again from Ghana, but intriguingly one of them might be from Nigeria! Very remarkable breakdown shown above. It features the second highest “Mali” score I have observed so far in my entire West African survey. Demonstrating that the so-called “Mali” region is not exclusive to Mandé speakers but could also be indicative of Gur and Senoufo origins! Up till recently the Senoufo language group used to be classified under the Gur language group. This larger language family is to be found in the northern parts of Ivory Coast, Ghana, Benin as well as Burkina Faso and Mali. AncestryDNA does not have any separate region yet for Burkina Faso (which is mostly Gur speaking, see this map). Otherwise this person’s breakdown would probably look a lot different because of closer genetic similarity. Right now any significant Gur/Senoufo affinity is more likely to be described as a composite of not only “Mali” and “Ivory Coast/Ghana”, but apparently also “Benin/Togo“! Especially the rather strong appearance of that last region might be surprising. It will be interesting to see if the same pattern also continues for other Senoufo/Gur speaking results or that perhaps this individual result turns out to have been less typical. Either way this result does indicate very clearly that a greater variation of Ivorian AncestryDNA results is to be expected, in line with actual ethnic background. The Ghanaian & Ivorian origins of Afro-Descendants in the Americas will indeed primarily be described by “Ivory Coast/Ghana” on AncestryDNA. But to a lesser degree also by “Benin/Togo” and “Mali”. 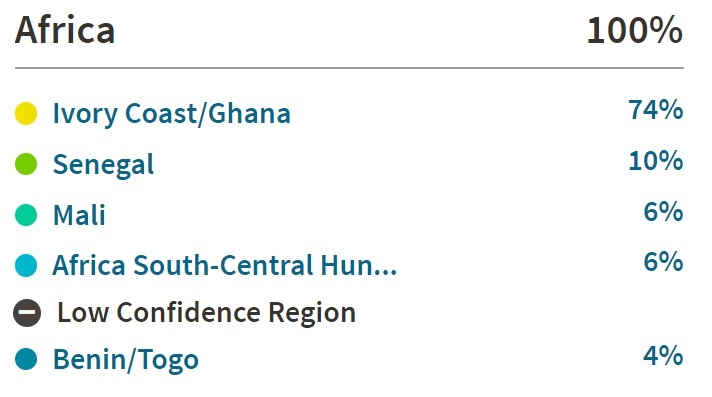 As these are the major secondary regions reported for Ghanaians and Ivorians in my survey. The major secondary regions for Liberians so far have been “Senegal” & “Mali”. The so-called “Ivory Coast/Ghana” region is indeed quite predictive of both Ghanaian and Ivorian origins. However in addition ancestry from Liberia and to a lesser degree (southern) Sierra Leone might also be described by this region. You will need to perform your own follow-up research in order to find out more specifics. 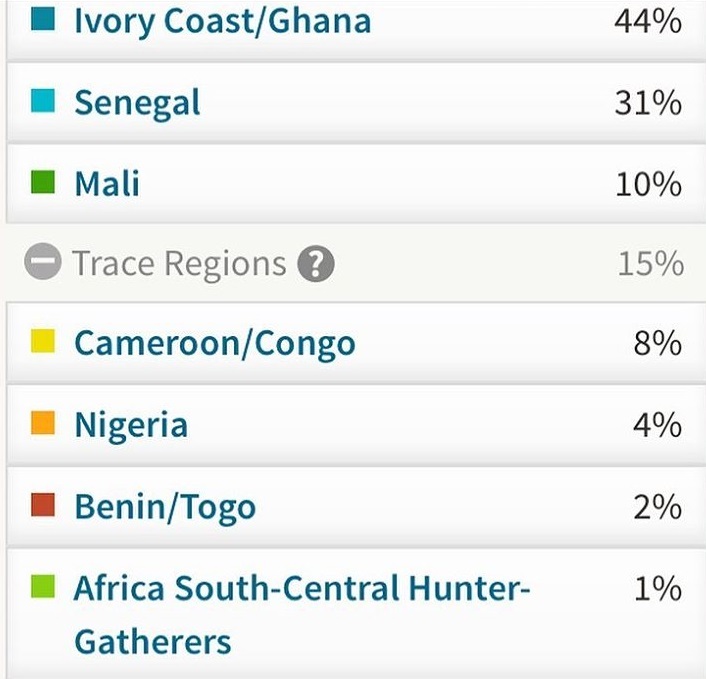 A very insightful selection of West African AncestryDNA results has been shown on this page. Even if still quite limited in number and scope. Keeping in mind the relevant context and limitations already discussed in the previous sections it seems that the “Ivory Coast/Ghana” and the “Benin/Togo” regions are both reasonably predictive. 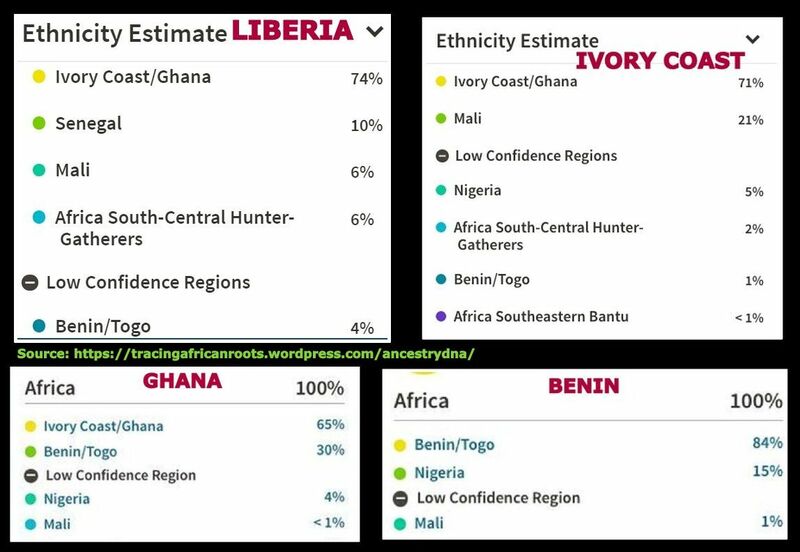 This is going both by my own preliminary survey findings (see chart 2.1) as well as by Ancestry’s own information in regards to how the “typical native” scores: respectively 86% for “Ivory Coast/Ghana) (n=115) and 82% for “Benin/Togo” (n=60). Also when comparing with the predictive accuracy of other regions (see chart 5.1 above) “Ivory Coast/Ghana” and “Benin/Togo” perform fairly well. Better than for example “Nigeria” and “Mali”. After going through this whole page it should be abundantly clear that the regional labeling by AncestryDNA is not intended to be taken too literally! My survey findings seem to indicate that ethno-linguistic background will be a more relevant determinant for West African AncestryDNA results rather than nationality per se. Correlating with the selection of West African samples by AncestryDNA in their reference panel and how well these samples happen to match with someone’s DNA. The regional percentages reported by AncestryDNA firstmost signal close genetic similarity to the samples taken from the countries or areas after which the regions have been named. And not actual descent or some kind of blood quantum as is too often assumed. The regional scores are also often reflective of ancient migrations & overlapping genetics/geography rather than any recent lineage (see section 3 for more detailed discussion). Admixture analysis such as provided by AncestryDNA is often drawing criticism for not being in line with unrealistic expectations. Specifically in regards to how ancestral categories should conform exactly to a person’s family tree and all the known ethnic lineage it may contain. Disregarding how such over-specified information is simply not to be found in our DNA. Atleast not given the current state of knowledge. However I myself do strongly believe that AncestryDNA’s Ethnicity Estimates can still be of great informational value as long as you know how to correctly interpret them; educate yourself about inherent restrictions; as well as combine with other research findings. One factor many critics fail to take into account is that Afro-descendants usually do not have the privilege of being able to fall back on paper trails when wanting to learn more about their African origins. Because of this lack of viable alternative Afro-Diasporans cannot afford to be snobbish about the imperfections of admixture analysis. Basically we will want to maximize all the informational value we can obtain. Taking any promising lead we can get and combine with other clues. Seeing the glass as half full and not half empty. Rather than be overcritical and risk loosing out on helpful information, even when only approximate or incomplete. Your admixture results will always be relevant to put things in perspective. If only to be able to (roughly) distinguish between major sources of ancestral origins versus minor lineage. Instead of taking a generalizing and dismissive stance each aspect of admixture analysis should be judged on its own strenghts and weaknesses. Precisely because of its still unrivaled West African regional specificity I find AncestryDNA to be more insightful than anything presently on offer by other commercial DNA testing companies as well as any thirdparty analysis such as available on Ged-Match, DNA Land etc.. My assessment is based on the almost 300 AncestryDNA results of native Africans I have seen by now. Which were usually in alignment (broadly) with their verifiable background (see this overview). Also my survey of Afro-Diaspora results was largely a confirmation of historically documented African origins for each nationality. Again such potentially profound information is not something to carelessly brush aside when wanting to Trace African Roots! 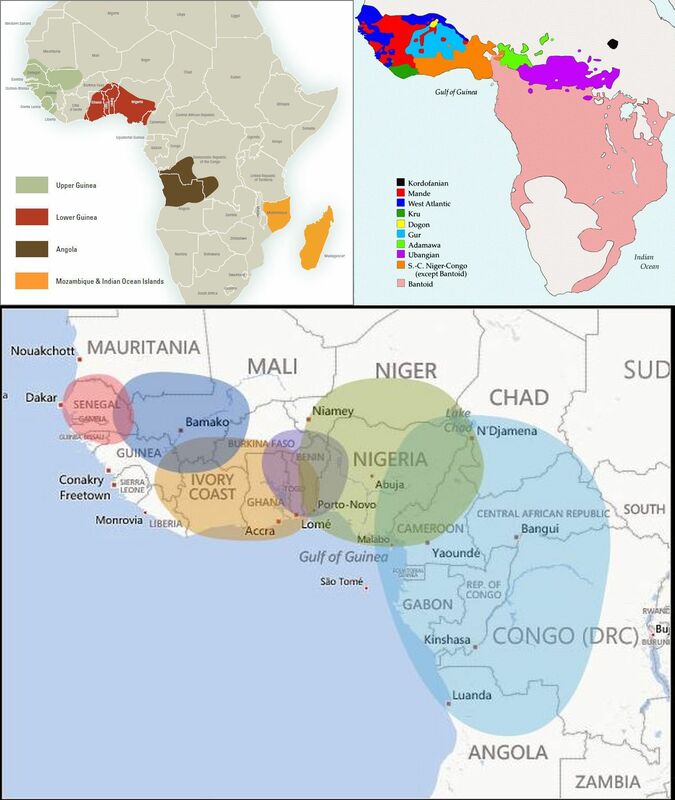 The three maps shown above illustrate three different levels of regional resolution which may all be useful when wanting to explore your West African origins. On the left the various bigger language groups of western Africa are being displayed. 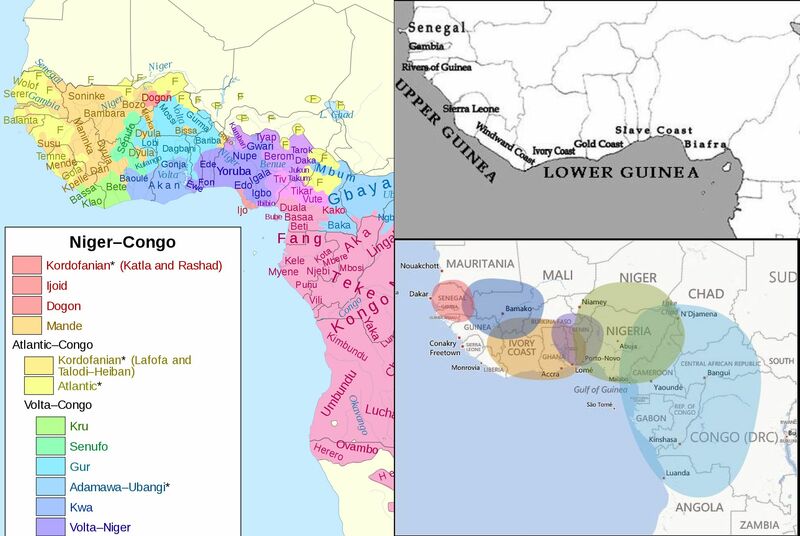 As discussed in section 3 these language groups tend to overlap to a great extent with AncestryDNA’s West African regions which are displayed in the right bottom corner. For a historical perspective I have also included a map which lays out all the relevant slave trade regions for West Africa. Again seemingly corresponding with AncestryDNA’s regions. The two-way distinction being made between Upper Guinea & Lower Guinea will not only be helpful to connect the dots when it comes to Afro-Diasporan history. In fact it may also lead to a greater understanding of genetic overlap patterns within West Africa and identifying West Africa’s main (pre)historical driving forces before the advent of Europeans. Combining insights from various disciplines is central to my personal research strategy. Always looking for complementarity, correct interpretation & plausibility. Critical but also staying open-minded and careful not to be dismissive when informational value can still be obtained. From my experience it can be very beneficial to acquire a basic grasp of this interplay between genetics, ethno-linguistics and (pre)history. It has definitely provided a deeper understanding of my own personal African origins as a Cape Verdean descendant. And in addition it has also clarified many of the questions which came up during my ongoing AncestryDNA survey. Helping me to see the origins of not only the Afro-Diaspora but also Africans themselves in much sharper focus. The analysis performed by AncestryDNA, even when pioneering and already very valuable in my estimation, is still only a first rudimentary step in deciphering one’s origins within Africa. The current nine African regions might very well have different ethnic implications for each separate nationality within the Afro-Diaspora but also in individual cases. Follow-up research may enable you to still zoom in closer to more specific West African lineage. In this regard group averages of AncestryDNA results for West African ethnic groups or nationalities can be very helpful in order to know what to expect more or less. And also in order to make a proper inference of how you yourself fit in the scheme given any other ancestral clues you might have. Even when entangling the intricate origins of an Afro-Diasporan will by default almost always be very tricky. Being aware of the greater interrelatedness of African genetics, history and ethnicity as shown in map 5.1 may still provide added value to your initial results and produce new research findings. Performing follow-up research based on your AncestryDNA score for the so-called “Ivory Coast/Ghana” region might very well enhance your understanding of the actual ancestors who passed on this part of your DNA. In some cases it might even help you pinpoint specific ethnic lineage! However as always it pays to be careful and not jump to conclusions, lest you may misidentify any of your ancestors. Below I will just describe a schematic approach. Intended in the first place for people with substantial amounts of “Ivory Coast/Ghana”.3 Naturally other approaches can be fruitful as well. Realize that any so-called “Ivory Coast/Ghana” % can also be indicative of either Liberian or Sierra Leonean DNA (among other less likely possibilities which I will exclude for now because of decreased odds)4. 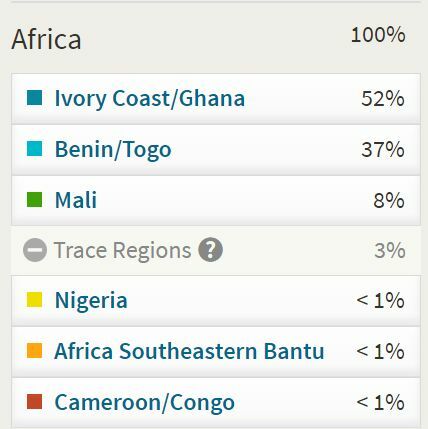 Realize that therefore your “Ivory Coast/Ghana” score could include ancestors from various countries, all at the same time. For example a 25% score “Ivory Coast/Ghana” for a typical African American might be traced back to 10 ancestors from Ghana, 5 ancestors from Liberia and 5 ancestors from Sierra Leone. Build up your family tree and attempt to trace back to your earliest known ancestral location in the Americas for all lines. The so-called “migrations” (a.k.a. genetic communities) you have been assigned to by AncestryDNA will usually be quite indicative in this regard! For example for African Americans it might be truly worthwhile to know if most of their ancestry is to be traced back to either Virginia or South Carolina. 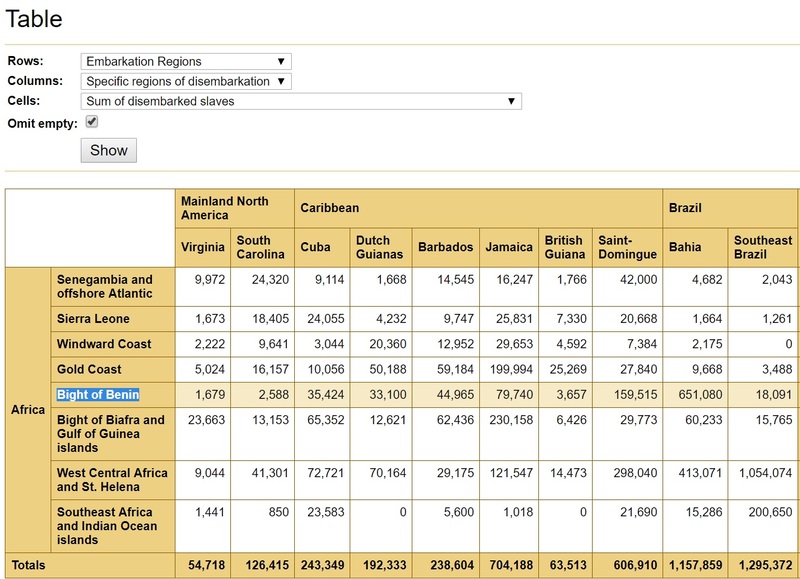 For West Indians it will be useful to know if there has been any inter-island migration within their family tree. Perform a full scan of your DNA matches and filter them for 100% African profiles. Determine if there are any matches among them from Ghana, Liberia Ivory Coast or Sierra Leone. 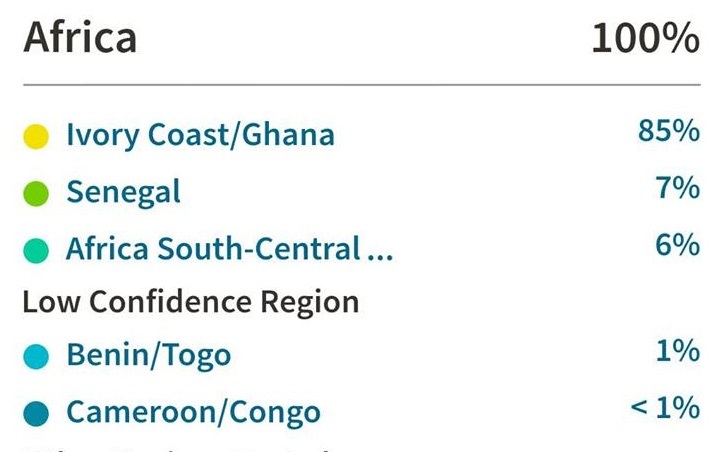 Be sure to also check if “Ivory Coast/Ghana” is being reported for them as a main region.5 Provided they are genuine IBD matches this could directly inform you if you happen to have any lineage from Liberia, Ghana etc.. However many reservations are to be taken into consideration! Firstly your MRCA might not be of the same background as your match. Also be aware that these matches will give you an indication of only one single family line. Furthermore realize that certain West African nationalities (Ivory Coast, Burkina Faso, Benin, Togo) are underrepresented among Ancestry’s customer database, while others might be fairly well represented (Liberia, Ghana, Nigeria). Stacking the odds in favour of receiving matches from those last countries. Which however may not per se be in line with their overall proportional contribution to your DNA. Moreover absence of evidence is not evidence of absence! Try fitting your West African matches into your family tree. This will be very tricky given scanty information and will also require a lot of patience. But it might still be worthwhile for eventually zooming in closer to your West African origins along a certain family line or even actually identifying a West African ancestor! Breaking down those brick walls based on paper trails! Having either your parents or other close family members also DNA tested will of course be greatly helpful. Especially if they share the same West African matches with you. However any shared matches for your West African match might do the trick I suppose. As long as you can figure out how these shared matches are to be placed in your family tree. More advanced techniques such as triangulation and DNA painting might also open up promising avenues. Source: TAST Database (2018). Follow this link for underlying numbers. Chart 5.2 is displaying the current findings of my ongoing survey of both Afro-Diaspora as well as West African AncestryDNA results (see this page for a full overview). Eventhough due to limited samplesize this data is preliminary it is still also cross-sectional because it was collected at random from various parts of the Diaspora and also within West Africa. Overall contributing to the robustness of the data. 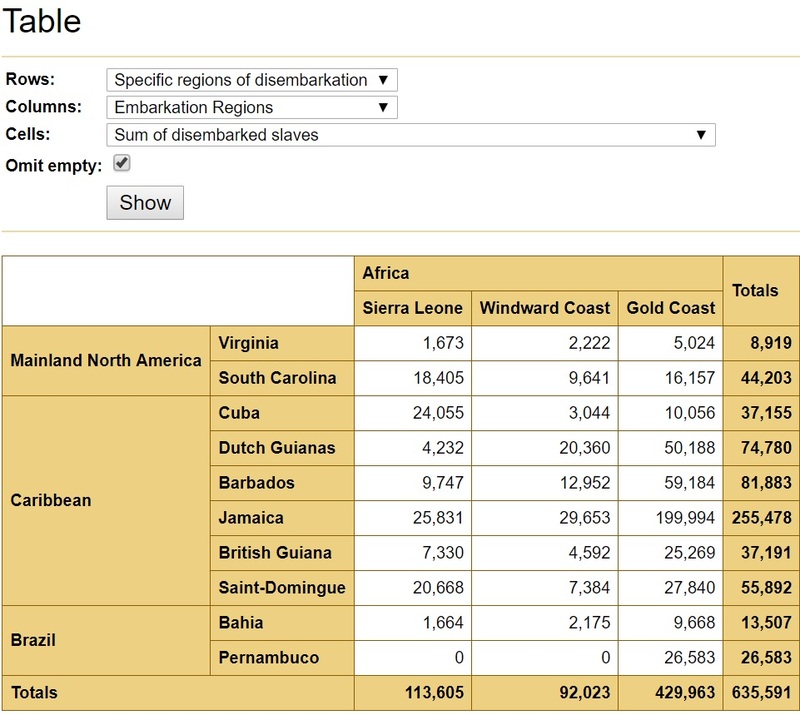 Chart 5.3 is taken from the Trans Atlantic Slave Voyages Database and features the proportional shares of each African slave trade region for selected parts of the Diaspora.6 The share of the so-called Gold Coast being highlighted, this would conform to the coastline of modernday Ghana. See also this map. We can establish that so far the so-called “Ivory Coast/Ghana” region is most prevalent among first Liberians, followed by Ghanaians and Ivorians. Also take note that as expected among other West Africans it is most subdued for Beninese and Nigerians. Given the discussion in the previous sections this outcome can be considered as roughly corroborating the prediction accuracy of the “Ivory Coast/Ghana” region among West Africans themselves. In regards to the Afro-Diaspora we can observe how so far “Ivory Coast/Ghana” is peaking for Anglo-Caribbeans while it is most subdued for Brazilians, Cape Verdeans and Mexicans. This conforms with what we know already about slave trade patterns. The Gold Coast being heavily visited by especially English slave traders but also Dutch ones (see chart 5.3). The Gold Coast Diaspora arguably being the greatest in the West Indies. While Upper Guinea and Central Africa are overwhelmingly the most important areas of provenance for Cape Verdeans, Mexicans and Brazilians. So again this would seem to be corroborating the prediction accuracy of the “Ivory Coast/Ghana” region. It’s interesting to ponder about a finer-grained composition of these “Ivory Coast/Ghana” scores (distinguishing between genuine Ghanaian origins versus Liberian origins etc.) for Jamaicans, Barbadians and Guyanese. We should then naturally also take into consideration the slave trade records for Windward Coast and Sierra Leone. While furthermore keeping in mind that Guyana was supplied with African captives also by the Dutch as after all Guyana used to be a Dutch colony, just like Surinam. From such a perspective it seems that so-called “Ivory Coast/Ghana” might entail the most varied origins for Guyana (as well as Surinam) and a follow-up research into possible Liberian, Ivorian or Sierra Leonean origins could potentially be most beneficial for them. This factor of largely undocumented slave trade is even more valid for the Hispanic Caribbean which also received captives by way of French, Dutch and Danish contraband traders. And in addition we should probably also take into account post-colonial migrations by English speaking West Indians into Puerto Rico and the Dominican Republic. Making for a rather convoluted situation which thanks to genetics is now however becoming more clearer. I suspect that for Hispanic Caribbeans with a relatively larger total amount of African DNA (>50%) also an increased relative share of “Ivory Coast/Ghana” might be observed. Especially for Puerto Ricans. In line perhaps with more recent African origins (1700’s/1800’s versus 1500’s/1600’s). I will devote a separate blog post to this topic eventually. The data for the USA is somewhat intermediate in all of this. 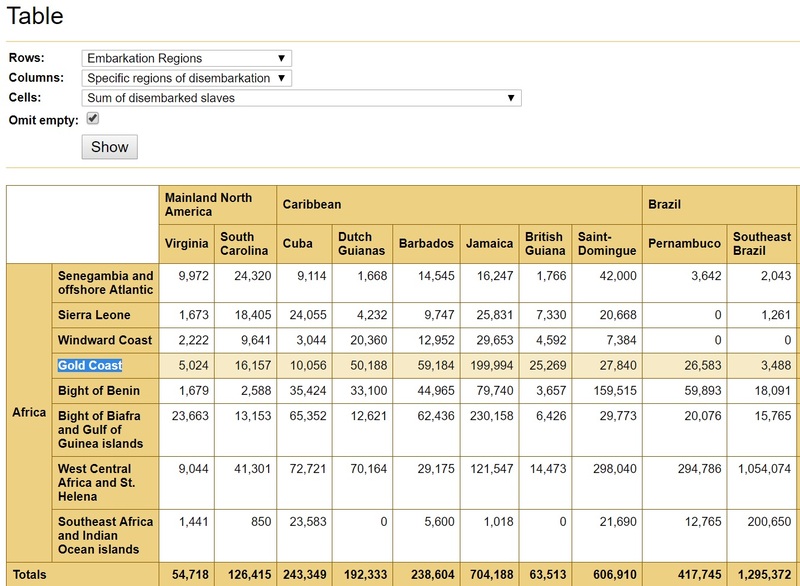 However it is striking how the estimated slave trade from Gold Coast (9-13%) into the US is lower than their group average for “Ivory Coast/Ghana” (19.6%). Inter-colonial slave trade by way of the West Indies might provide one half of the explanation. But we can be practically sure that also the genetic contributions of the Windward Coast and Sierra Leone are having their impact in so-called “Ivory Coast/Ghana” scores for African Americans. Especially for those with strong South Carolina connections. I will explore this in greater detail in the next paragraph. Source: TAST Database. Follow this link for underlying numbers. Chart 5.4 features the relative shares of slave trade originating with the regions of “Sierra Leone” (also includes Guinea! ), “Windward Coast” (includes both Liberia & Ivory Coast) and “Gold Coast” (Ghana). Take note that it adds up to 100% along the row! In order to focus solely on the slave trade within this area I have left out all other slave trade regions from the equation. Map 5.3 is also based on TAST Database with its estimates of 388,747 captives being disembarked in North America. Very useful because it is providing more detail beyond the traditional slave trade regions. Take note for example how the so-called “Sierra Leone” slave trade region is now split up between the modernday countries of Guinea & Sierra Leone (based on embarkation port details, see this overview). The same goes for the Windward Coast information which is now split up between Liberia and Ivory Coast. Even when similar to the AncestryDNA regions these modernday country origins are not to be taken too literally 😉 Inland slave trade routes could very well cross borders after all. As can be seen in chart 5.4 the relative importance of either Sierra Leone (incl. Guinea), Windward Coast (Liberia & Ivory Coast) or Gold Coast (Ghana) varies a lot for each particular destination within the Americas. However it seems that for most destinations in the Americas slave trade by way of the Gold Coast was prevalent. Therefore so-called “Ivory Coast/Ghana” amounts reported for Afro-descendants from those places are likely then to be firstmost referring to Ghanaian ancestry. Even when my survey findings are demonstrating that Ghanaian DNA is not exclusively described by “Ivory Coast/Ghana”. But also by “Benin/Togo” and to a lesser degree “Mali” as well. However otherwise it’s quite apparent that the so-called “Ivory Coast/Ghana” region as reported for African Americans is due to not only Ghanaian ancesty but also Liberian origins and probably to a lesser degree also (southern) Sierra Leonean ancestry. Reviewing chart 5.4 again it seems that especially South Carolina might have an increased probability for non-Ghanaian lineage being behind so-called “Ivory Coast/Ghana” amounts. Its Gold Coast share being one of the lowest (36.6%), while its Sierra Leone share is one of the highest (41.6%). But also for Virginia in fact the shares for Windward Coast and Sierra Leone are quite pronounced when compared with other parts of the Afro-Diaspora. Combined they are nearly equal to the Gold Coast share of 56.3%. Personally I have a hunch that the breakdown for Virginia (even though less in numbers) might be more representative for the average African American than the South Carolina breakdown. But all in all I suspect that there’s not a dramatic difference between the likelihood of “Ivory/Coast/Ghana” denoting either Liberian or Sierra Leonean origins rather than Ghanaian ones for African Americans. I’m guessing the odds pretty much even out. The best way to get more certainty is finding any locally born matches from these countries. Even when actually they will (usually) only represent one single family line, which might imply a DNA contribution of about 1% on average. 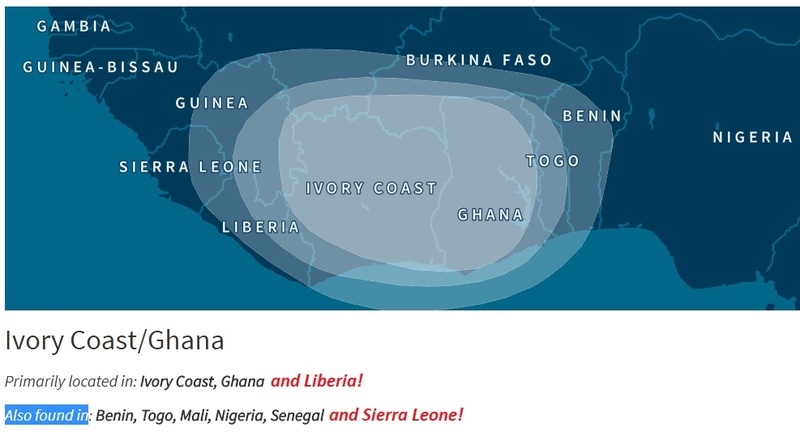 Just as a final reminder it should be kept in mind that the actual amounts being reported for the so-called “Ivory Coast/Ghana” regional components are first-most a measurement of the genetic similarity to most likely Akan (Brong) samples from Ghana and possibly in addition Kru samples as well as perhaps south Mandé samples from Ivory Coast. However it will by default only be a rough estimate as more fitting sample groups to compare with may very well be missing within Ancestry’s current Reference Panel. Follow-up research to make more sense of these rough estimates is therefore required. Even when in itself AncestryDNA’s regional breakdown is already quite insightful and also in line with what you might expect given West African genetics and the documented origins of the Afro-Diaspora based on slave trade records. Still one is left to wonder how might an updated and expanded configuration of Ancestry’s reference panel lead to improvement? Firstly a careful selection of relevant reference populations to be added would seem prudent. Especially the inclusion of Gur samples from Burkina Faso might result in sharper regional delineation. Furthermore I suppose replacing the current “Ivory Coast/Ghana” region with three separate and properly labeled regions to describe and measure genetic affiliations with either Kru, Akan or southern Mandé samples could also be beneficial. Performing follow-up research based on your AncestryDNA score for the so-called “Benin/Togo” region might very well enhance your understanding of the actual ancestors who passed on this part of your DNA. In some cases it might even help you pinpoint specific ethnic lineage! However as always it pays to be careful and not jump to conclusions. Below I will just describe a schematic approach. Intended in the first place for people with substantial amounts of “Benin/Togo”.3 Naturally other approaches can be fruitful as well. 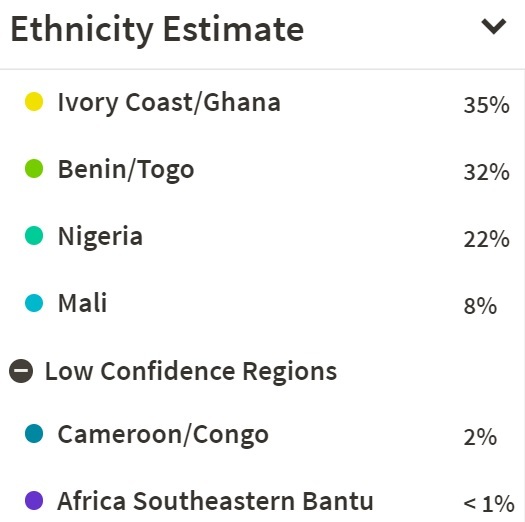 Realize that any so-called “Benin/Togo” % can also be indicative of either Ghanaian or Nigerian DNA (among other less likely possibilities which I will exclude for now because of decreased odds and/or lack of data). 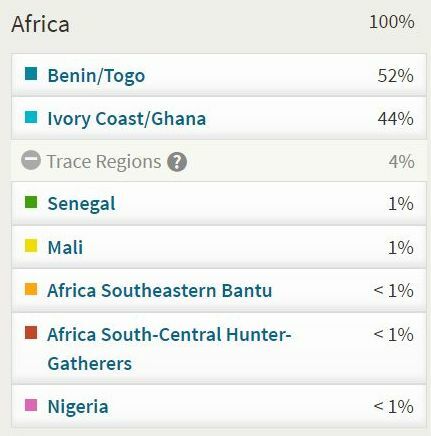 Realize that therefore your “Benin/Togo” score could include ancestors from various countries, all at the same time. 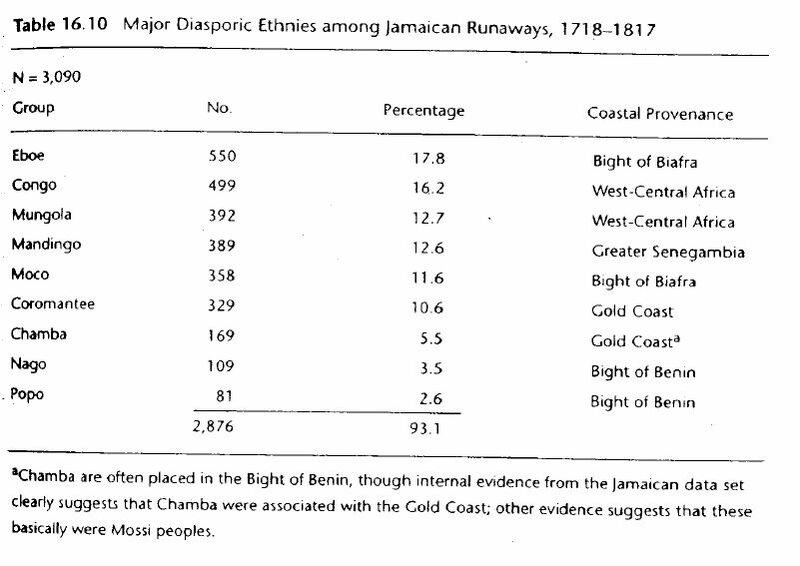 For example a 25% score “Benin/Togo” for a typical Barbadian might possibly be traced back to 10 ancestors from Benin, 8 ancestors from Ghana and 7 ancestors from Nigeria. Just to name one possible combination out of many others depending on your individual family history. Build up your family tree and attempt to trace back to your earliest known ancestral location in the Americas for all lines. The so-called “migrations” (a.k.a. genetic communities) you have been assigned to by AncestryDNA will usually be quite indicative in this regard! For example for African Americans it might be truly worthwhile to know if most of their ancestry is to be traced back to either Virginia or South Carolina. For people from Louisiana any distant Haitian ancestry could be relevant.7 For West Indians it will be useful to know if there has been any inter-island migration within their family tree. Perform a full scan of your DNA matches and filter them for 100% African profiles. Determine if there are any matches among them from Nigeria, Benin, Togo or Ghana. 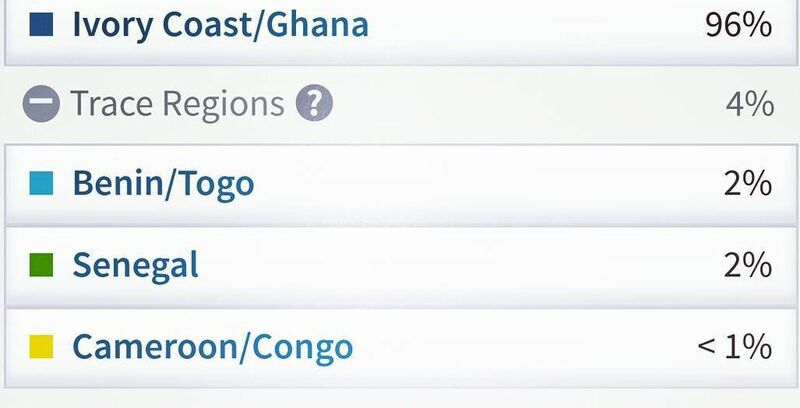 Be sure to also check if “Benin/Togo” is being reported for them as a main region.8 Provided they are genuine IBD matches this could directly inform you if you happen to have any genuine lineage from Benin or Togo as opposed to rather having either Ghanaian or Nigerian ancestors which passed on this “Benin/Togo” part of your DNA. However many reservations are to be taken into consideration! Firstly your MRCA might not be of the same background as your match. Also be aware that these matches will give you an indication of only one single family line. Furthermore realize that certain West African nationalities (Ivory Coast, Burkina Faso, Benin, Togo) are underrepresented among Ancestry’s customer database, while others might be fairly well represented (Liberia, Ghana, Nigeria). Stacking the odds in favour of receiving matches from those last countries. Which however may not per se be in line with their overall proportional contribution to your DNA Moreover absence of evidence is not evidence of absence! Try fitting your West African matches into your family tree. This will be very tricky given scanty information and will also require a lot of patience. But it might still be worthwhile for eventually zooming in closer to your West African origins along a certain family line or even actually identifying a West African ancestor! Breaking down those brick walls based on paper trails! Having other close relatives also DNA tested will of course be greatly helpful. Especially if they share the same West African matches with you. However any shared matches for your West African match might do the trick I suppose. As long as you can figure out how these shared matches are to be placed in your family tree. More advanced techniques such as triangulation and DNA painting might also open up promising avenues. Chart 5.5 is displaying the current findings of my ongoing survey of both Afro-Diasporan as well as West African AncestryDNA results (see this page for a full overview). Even though due to limited sample size this data is preliminary it is still also cross-sectional because it was collected at random from various parts of the Diaspora and also within West Africa. Overall contributing to the robustness of the data. 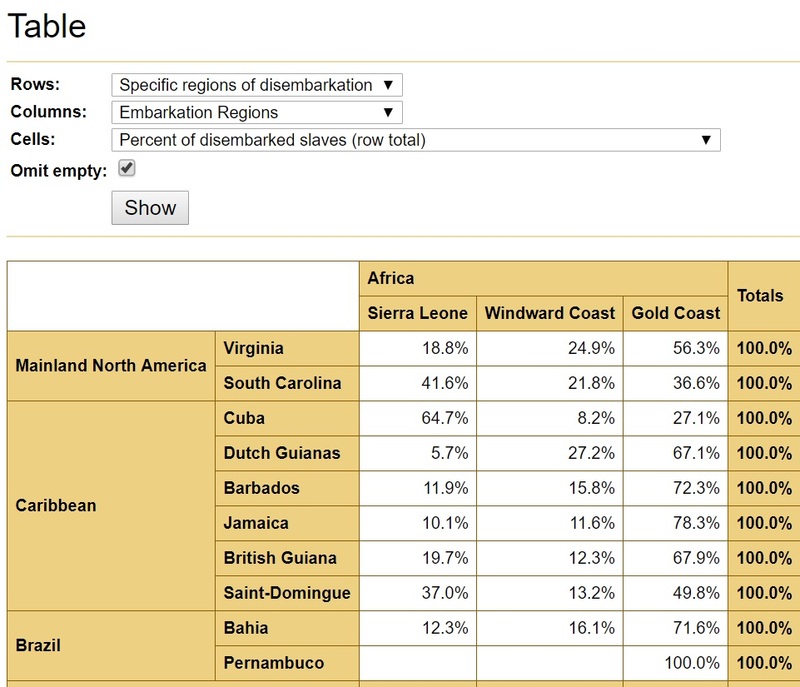 Chart 5.6 is taken from the Trans Atlantic Slave Trade Database and features the proportional shares of each slave trade region for selected parts of the Diaspora.6 The share of Bight of Benin (a.k.a. Slave Coast) is being highlighted. This would be the coastline of modern-day Togo, Benin and western Nigeria. See also this map. We can establish that so far among West Africans the so-called “Benin/Togo” region is most prevalent among Beninese, followed by Nigerians and Ghanaians. Also take note that as expected among other West Africans it is most subdued for Ivorians and practically non-existent so far for Liberians. Given the discussion in the previous sections this outcome can be considered as roughly corroborating the prediction accuracy of the “Benin/Togo” region among West Africans themselves. Even when obviously the sample size for Benin itself is very minimal and also samples from Togo & Burkina Faso are not yet included in my survey. In regards to the Afro-Diaspora we can observe how so far “Benin/Togo” is peaking for Barbadians & Haitians while it is most subdued for Cape Verdeans and Mexicans (whose overwhelmingly predominant areas of provenance are Upper Guinea and Central Africa). This conforms more or less with what we know already about slave trade patterns (see chart 5.6). Going by proportion and sheer numbers of slave trade with the Bight of Benin as well as cultural retention (Vodou!) the primary ranking of Haiti (Saint Domingue) is not surprising at all. 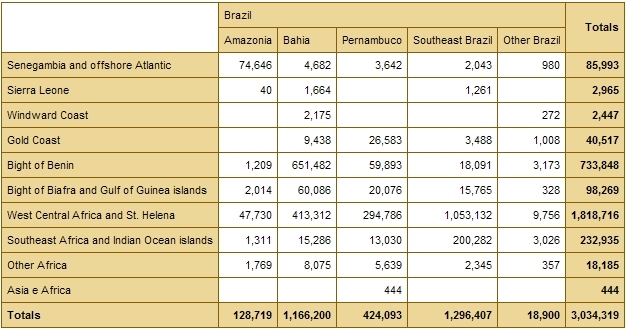 Actually going by these criteria Brazilians from Bahia might be expected to have an even greater “Benin/Togo” imprint. However as clearly illustrated by the minimal share of Bight of Benin in the slave trade with southeast Brazil (1.4%) this is not something to be generalized for the whole of Brazil. Which seems to reflect also in the more so intermediate group average of 12% “Benin/Togo” for my Brazilian sample group so far. Perhaps in contradiction to general knowledge but the Bight of Benin was actually also a very significant trading area for African captives who ended up in English as well as Dutch colonies within the West Indies. In particular Barbados incorporated a relatively large segment of people shipped from the Bight of Benin (18.8%). It seems that also genetically this Bight of Benin connection has left a profound legacy. Even when most likely also Ghanaian & (southeast) Nigerian origins are to be included in that very impressive group average of 31.7% “Benin/Togo”. Furthermore my Barbadian sample size (n=15) is still quite limited so this preliminary group average might actually also decrease with the future addition of more Barbadian AncestryDNA results into my survey. For more in depth discussion see next paragraph. The “Benin/Togo” group averages for Hispanic Caribbeans are somewhat intermediate but also hiding a great deal of underlying variation. They may yet provide extra insight as I suspect that for Hispanic Caribbeans with a relatively larger total amount of African DNA (>50%) also an increased relative share of “Benin/Togo” will be observed, on average. Especially for Dominicans. In line with perhaps more recent African origins (1700’s/1800’s versus 1500’s/1600’s). I will devote a separate blog post to this topic eventually. The so-called “Benin/Togo” scores reported for African Americans are more complex to disentangle. For now I will already note that based on charts 5.5 & 5.6 the estimated slave trade from the Bight of Benin (2%-3%) into the US is remarkably lower than the African American group average for “Benin/Togo” (14.7%). This is actually true for several other nationalities in my survey as well. But for none is the difference so striking! One might already deduct that the odds of “genuine” Beninese origins are lowest for African Americans and highest for Brazilians & Haitians. Based on a comparison of proportional shares in slave trade from either the Gold Coast (mostly Akan speakers? but also Volta-Niger speakers such as the Ewe), Bight of Benin (mostly Volta-Niger speakers, such as the Fon but also Yoruba) and Bight of Biafra (mostly Volta-Niger speakers, such as the Igbo). This comparison is heavily skewed toward the Bight of Benin for both Haiti and Brazil. But clearly not so for the USA. Its proportional share for Benin proper (2.26%, see map 5.3) probably being one of the lowest across the entire Afro-Diaspora! How to account for unexpectedly high “Benin/Togo” scores among African Americans & Anglo-Caribbeans? Maximum “Benin/Togo” scores among some of my West African survey participants. 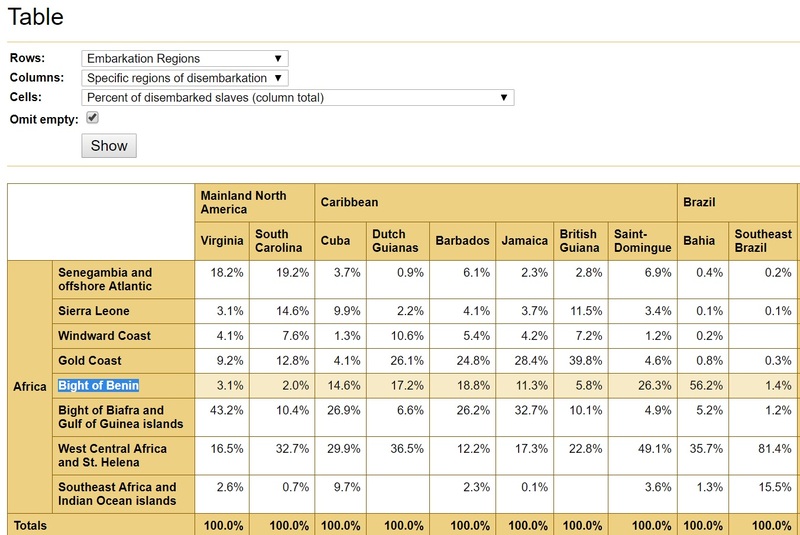 One of the most surprising outcomes of my ongoing survey of AncestryDNA results across the Afro-Diaspora has been the higher than expected average scores for “Benin/Togo” seen for African Americans and to a lesser degree also for Anglo-Caribbeans such as Jamaicans and Barbadians.9 It is surprising because even given individual variation and many possibilities of “real” Beninese ancestry to some (minor) degree, documented Trans Atlantic slave trade data does not seem to support such a consistently high average level of “Benin/Togo”, especially not for the USA. It’s intriguing to think about what might possibly be causing this outcome. I will attempt to take this discussion one step further based on additional context. The following four scenario’s I will describe may provide partial explanations for the unexpectedly high “Benin/Togo” percentages being reported but as a fair warning in advance they are also to some degree speculative! 1) Large proportion of Ewe captives involved in Gold Coast slave trade? One of the key findings of my West African survey has been that the actual ethnic background of a West African might be a better predictor of his or her breakdown on AncestryDNA rather than their nationality. We can clearly see this in chart 5.7 where I have specified some subgroups along ethnic lines for my Ghanaian and Nigerian survey participants. Of course allowance to be made for my minimal sample size and possible simplification of more complex ethnic backgrounds. 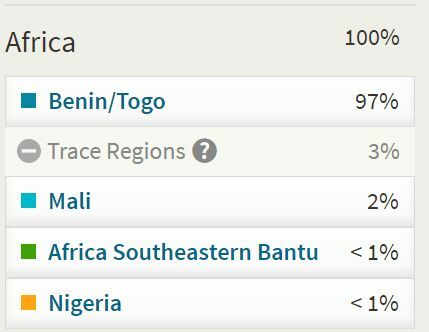 It is still very useful to be aware that my Ewe samples from Ghana show the highest “Benin/Togo” group averages so far (aside from 2 actual Beninese persons). While also for various southern Nigerian ethnic groups “Benin/Togo” is a significant genetic component. Any African American or West Indian descendant of either eastern Ghanaians (in particular the Ewe and perhaps also Ga-Adangbe) or southern Nigerians is therefore likely to have inherited part of their so-called “Benin/Togo” score through them. The genetic impact of non-Akan Ghanaians (such as the Ewe but also Gur speakers from the north) on the Afro-Diaspora may have been seriously underestimated up till now. Their historical presence in the Americas often being either neglected or ignored. In part due to an overemphasis on the Akan and their prestigious associations with the Ashanti empire. To be sure the so-called Coromantee influence has indeed been profound in especially the Anglo-Caribbean. However it is perhaps sometimes forgotten how cultural assimilation of less influential ethnic groups from Ghana into the Akan/Coromantee mold may also have been rampant. It is useful to know that despite being a majority the Akan make up less than 50% of the current-day population of Ghana (see this link). While the actual share of Akan people among Gold Coast captives is yet to be determined, but this could actually also have been less than 50% (see quote above). Due to their geographical location Ewe and Ga-Adangbe captives in the Americas might have been conflated with either the Akan or also with fellow Gbe speakers from Togo/Benin. The latter were often labeled as “Papa” or “Popo” at least in English or Dutch colonies. There exists another related slave ethnonym, “Mina”, which could also be very relevant in this regard. The correct interpretation of this term has been contested among historians. Both Akan and Gbe being suggested as the main intended group of people for this “Mina” designation. Naturally this will often be context-dependent as this term was used not only in French but also Portuguese and Spanish colonies. However my AncestryDNA survey findings might put a new twist on it. Despite being shipped away from the so-called “Gold Coast” (and also counted as such in the Trans Atlantic Slave Trade database) a higher than expected number of these captives might actually originally have been from the borderlands with Togo (so-called Volta region). Or also in fact from Togo or even Benin itself! Only ending up in the European slave ports along the Gold Coast instead of the Bight of Benin because of coastal shipping or overland routes. All of which is to say that the proportion of Gbe (incl. Ewe) & Ga-Adangbe speaking people among Gold Coast captives might have been larger than hitherto imagined. Obviously much more research is needed to establish firmer ground. However my preliminary AncestryDNA survey findings might already be indicative of some of the main trends. Going by the preliminary group averages depicted in chart 5.7 it’s least likely that any “Benin/Togo” amount being reported for an African American or Anglo-Caribbean would have been inherited by way of an Akan ancestor (3.9%). 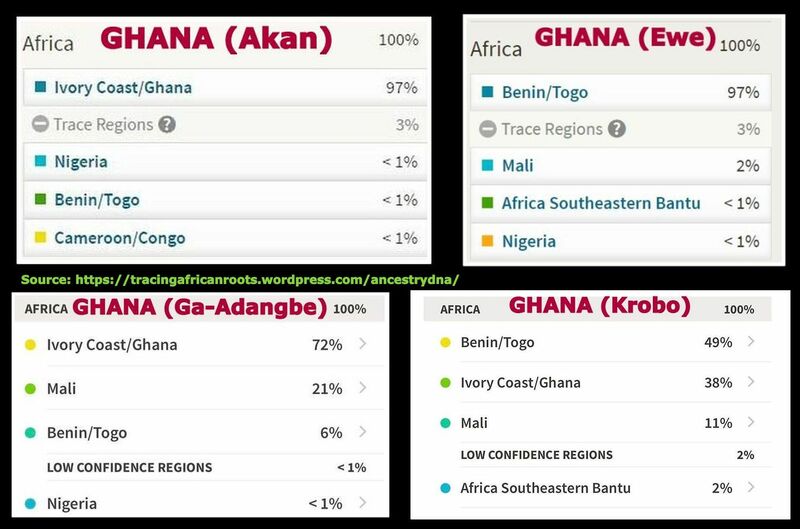 As actually the “Ivory Coast/Ghana” region is a quite accurate predictor of Akan lineage (but not exclusively so!). For my Ga-Adangbe samples so far it’s a rather mixed picture (19% but mostly due to 1 perhaps atypical sample). But the occurrence of predominant “Benin/Togo” amounts (71%) among my Ewe samples seems to be a quite consistent and telling outcome already. Aside from indicating (eastern) Ghanaian lineage so-called “Benin/Togo” might also very well be derived from southern Nigerian ancestors. As can be seen in chart 5.7 my Nigerian survey participants so far score in between 20-30% for “Benin/Togo”. However in individual cases it can get as high as 40% or even 50%, as shown in the screenshots below chart 5.7. That compilation picture is featuring the maximum scores for some of my sample groups (see this link for maximum scores among the Afro-Diaspora). This “Benin/Togo” reporting is quite consistent across the board for southern Nigerians. It is not at all exclusive to the Yoruba but also to be observed for the Edo and Igbo! And while not shown in chart 5.7 actually also for persons of Efik, Urhobo or Isekiri descent (see my Nigerian survey). So any of these southern Nigerian ethnic groups is likely to have passed on so-called “Benin/Togo” DNA markers into the genepool of African Americans & Anglo-Carribeans. In section 3 and also on this page I have already discussed why the genetic origins of actual Nigerians are not fully covered by just only the region “Nigeria”. Additional regions are needed to describe their DNA, in particular “Benin/Togo” but also “Cameroon/Congo”. Similarly also for African Americans & Anglo-Caribbeans the “Nigeria” region may not be reporting the full extent of someone’s Nigerian origins. But rather it may tend to underestimate them, generally speaking. And the reported “Benin/Togo” amounts for African Americans & Anglo-Caribbeans might in part actually also have been inherited by way of Nigerian ancestors who already carried these DNA markers in their own genome. 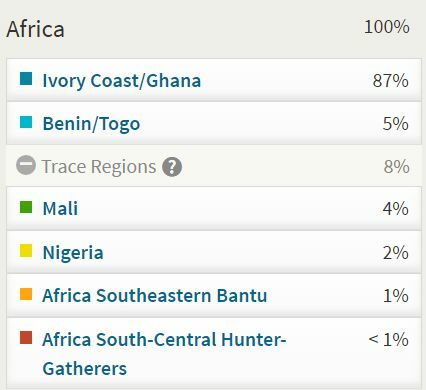 Obviously putting an exact number on this additional Nigerian genetic contribution by way of “Benin/Togo” is impossible to make right now. 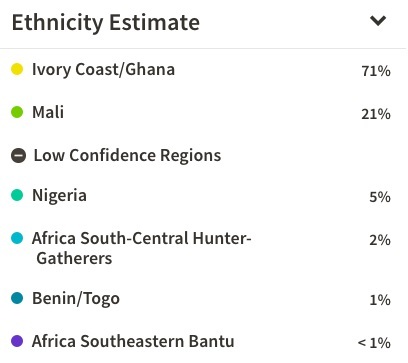 However just taking a wild swing at the available data I wouldn’t be surprised if it turns out that about 5% of the 14.7% “Benin/Togo” average score for African Americans is actually hailing from southern Nigeria. While another 5% could actually be from eastern Ghana. The remaining 4.7% “Benin/Togo” then being much more in line with what you would expect based on the slave trade records. Both Ghana (14.46%) and Nigeria (16.34%) being much more likely to host source populations for African Americans than Benin (2.26%, see map 5.3). Source: Gregory E. O’Malley, “Beyond the Middle Passage : Slave Migration from the Caribbean to North America, 1619-1807”, The William and Mary Quarterly, 66, (1), 2009. As discussed above both eastern Ghanaian and southern Nigerian origins for any “Benin/Togo” reporting among Anglo Caribbeans and African Americans are certainly not to be ruled out. But it seems undeniable already that many of such scores will also include a significant and genuine ancestral tie with people from current day Benin & Togo. Most apparently for Barbados but also for Jamaica which has a “Benin/Togo” group average that is only just falling behind the one for Haiti (21.4% vs 23%, see chart 5.5). This rather pronounced impact is possibly to be explained by the relatively early arrival of the contingent of Bight of Benin captives in the Anglo Caribbean. Combined with dispersal into North America through inter-colonial slave trade this may have set off a demographic founder effect in both the West Indies as well as the USA. English slave trade patterns show a great deal of fluctuation across time and also in regards to destination within the Americas. Generally speaking, as shown in chart 5.8, up to 1730 the Bight of Benin seems to have played a significant role but afterwards its share in English slave trade decreased sharply. Given that most of English slave trade was geared towards the West Indies rather than North America this would be especially relevant for Barbados and Jamaica. The more specific and up-to-date slave voyage data for Barbados confirm that especially during the late 1600’s and early 1700’s there was indeed a major inflow of captives from Benin arriving in the West Indies. And possibly by way of inter-colonial slave trade these captives were also partially brought over first to Jamaica when its plantation economy was being set up in the late 1600’s as well as to the USA. 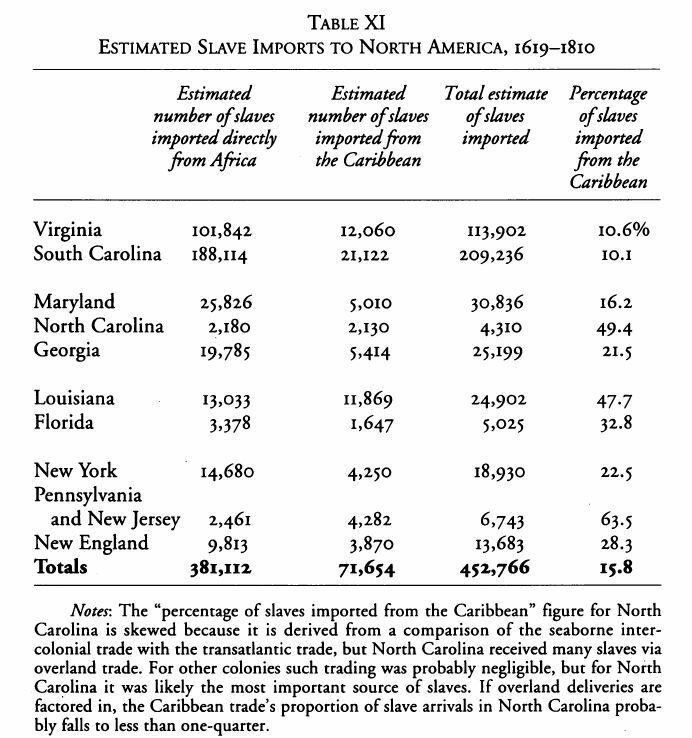 According to recent research (see chart 5.9) this inter-colonial slave trade via the West Indies would amount to about 15% of overall slave importations for the USA (domestic and overland slave trade from within the US is however not included!). Inter-colonial trade was more pronounced for some states than others. Apparently being continued even when trans-atlantic slave trade was also in full force throughout the 1700’s. But proportionally speaking this inter-colonial slave trade from the West Indies might have made the biggest impact right from the start in the late 1600’s and early 1700’s. These decades marked the crucial beginning of the formation of African Americans as well as Jamaicans and Barbadians as new populations through the blending of ethnic lineages from various parts of Africa. An exact reconstruction of this process might never be possible. But increasingly both historical and now also genetic evidence seems to be forthcoming that people from the Bight of Benin may have been more prominent in all of this than imagined so far. 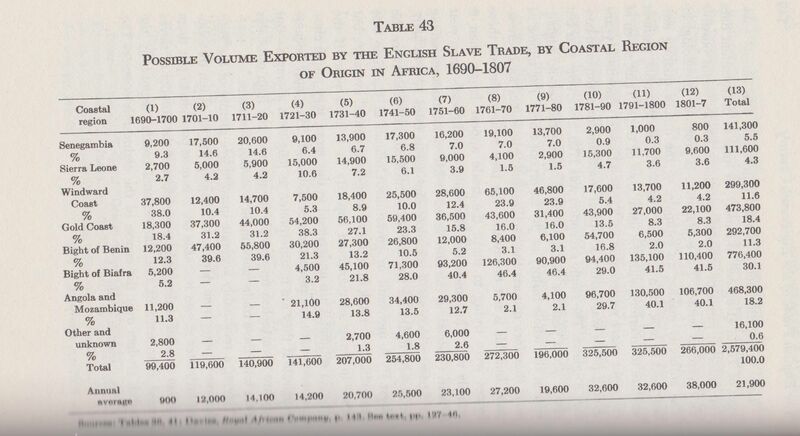 We have already established that English as well as American slave trade with the Bight of Benin would have been relatively minor or even insignificant after the 1730’s (see chart 5.8). However illegal slave trade taking place after 1807/1808 may have again depended on the the Bight of Benin to a greater degree (e.g. the Clotilde voyage in 1859!). The extent of these illegal slave trading activities for the USA and in particular its demographic impact is usually assumed to be rather restricted though. Given the very low reported rate of African born slaves in the USA throughout the 1800’s and the documented early creolization of American slaves in general this option therefore seems least likely to offer an overall explanation for the high averages of reported “Benin/Togo”. Although in selected individual cases it could very well be. Especially for the Gulf states as well as the coastal area of South Carolina & Georgia there might be increased odds. It might be useful to know that African born slaves at that time were often referred to as “Guinea man” or “Guinea woman” (“Guinea” being a standard term to refer to coastal West Africa in a general way, see this link). I have come across such terms a few times already in slave narratives written down in the early 1900’s. Implying they were uncommon but not totally unheard of yet. Dedicated family tree research might be very rewarding then as documentation might still exist even. For the Anglo-Caribbean a related ancestral option arises from the fact that during the 1800’s thousands of so-called recaptives or also Liberated Africans were being settled and employed as contract labourers in the West Indies. Many of these Liberated Africans were recruited among ex-captives who were originally shipped from the Bight of Benin. It is often said that aside from Congo’s (a blanket term for Central Africans) also Yoruba’s (a.k.a. Nago) were predominant among them. In line with the main areas of illegal slave trade for Brazil & Cuba in that time period. After having been intercepted these Liberated Africans were being introduced by the English into their colonies with the greatest demand of labour due to still expanding sugar plantations. This was mostly the case for Guyana and Trinidad but also Jamaica may have received close to 12,000 of these recaptives. The four possible ancestral scenario’s I have described above all have varying degrees of plausibility & probability. Each one of them or also any given combination might apply in individual cases. Each case to be judged on its own merits naturally and depending also on any possible additional clues. In order to at least fit in some of the pieces of the “Benin/Togo” puzzle follow-up research is simply a must! As I have argued above aside from African DNA matches also a close study of the slave trade patterns and just any relevant piece of local history for your earliest known ancestral location in the Americas might go a long way. Even when clear-cut results will not be guaranteed. As a final reminder I like to stress yet again that so-called “Benin/Togo” is not an exclusive marker for any given ethnic group nor nationality. Any amount scored for this region can be suggestive of many different ethnic origins from eastern Ghana into southern Nigeria, while possibly also some ethnic groups further west such as the Gur speaking people in Burkina Faso and northern Ivory Coast might score substantial amounts for this region as well. All of this aside from possibly pinpointing genuine origins from within either Benin or Togo. Right now there’s just no way of making the distinction. Perhaps with an upcoming update there will be more clarity. 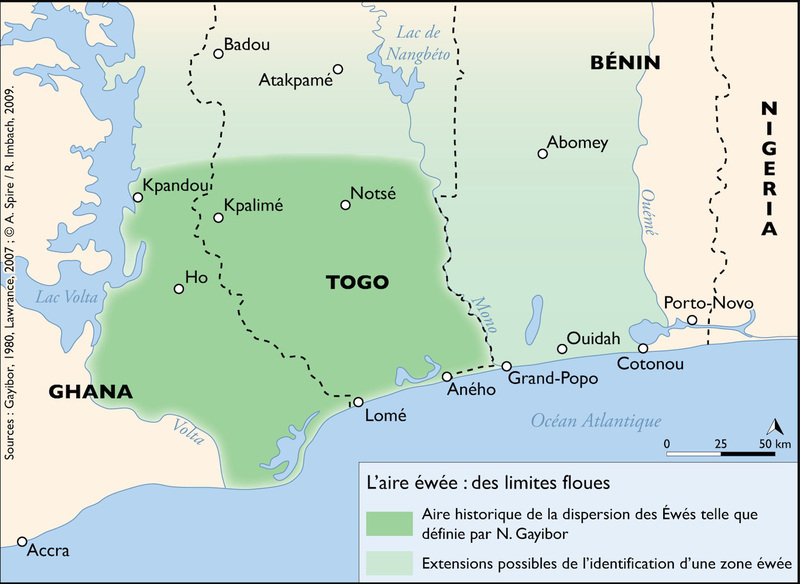 But even so a perfect measure of “genuine” Beninese ancestry might never truly be possible due to artificial manmade borders and a high degree of genetic similarity between neighbouring ethnic groups, especially those belonging to the Volta-Niger language group (Gbe, Ewe, Fon, Aja, Yoruba, Edo, Igbo etc.). In the end all of these ancestral regions are afterall constructs much like the very concept of “ethnicity” itself. 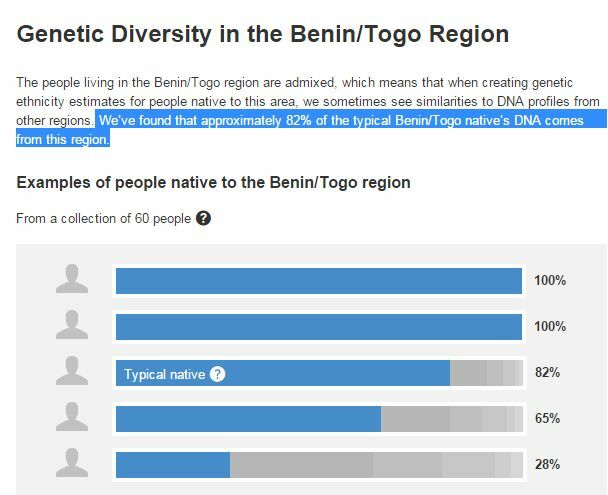 Actual amounts being reported for the so-called “Benin/Togo” region are first most a measurement of genetic similarity to most likely Gbe speaking samples from Benin and Togo. Nothing more but also nothing less! Because in themselves AncestryDNA’s estimates are already quite insightful and also roughly in line with what you might expect given West African genetics and the documented origins of the Afro-Diaspora based on slave trade records. Still one is left to wonder how might an updated and expanded configuration of Ancestry’s reference panel lead to improvement? Firstly a careful selection of relevant reference populations to be added would seem prudent. Especially the inclusion of Gur samples from Burkina Faso might result in sharper regional delineation. 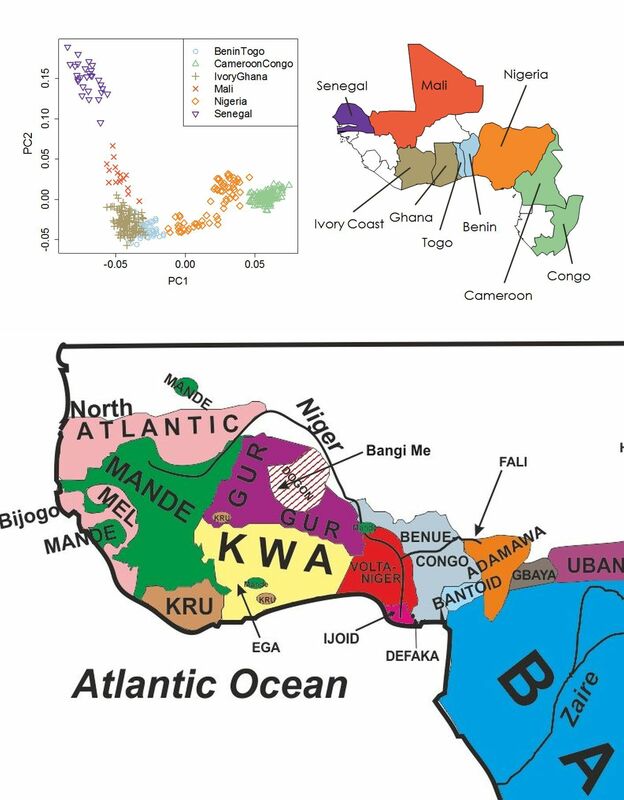 The creation of a less confusingly labeled region to describe and measure genetic affiliations with Gbe samples from not only Benin and Togo but also eastern Ghana would also be beneficial. And in order to decrease the inevitable overlap with fellow Volta-Niger speaking southern Nigerians perhaps it might be a good idea to for once dispense with the ubiquitous Yoruba samples and only rely on more genetically distinctive Igbo samples for the “Nigeria” region and perhaps also add in Middle Belt Nigerian samples? 1. I am aware that ethnicity can be a sensitive topic for West Africans. Aside from wanting to learn more about my own West African roots my motivation to research these so-called Ethnicity Estimates is purely scholarly. It stems from a deep fascination with West Africa’s ancient population migrations, its many connections with the Afro-Diaspora as well as a profound love for its vibrant & diverse culture. I do not condone the misuse of my research for identity politics! I am in full support of democratizing knowledge. However when parts of my work are being copied I do expect that a proper referral to my blog and the additional context it provides will be made. 2. I like to express my sincere gratitude to all the persons whose online posting of their results has made this survey possible! Most results on this page have been shared with me directly by invitation. But some were also collected by me from public websites or social media. As I found them to be of potentially great educational benefit for others. I have asked for prior consent whenever I could but regrettably wasn’t able to do so in all cases. I have naturally taken great care to cut away any name details in order to safeguard everyone’s privacy. Apologies in advance to anyone who recognizes their results and is not comfortable with this blog page featuring them. Please send me a PM and I will remove them right away. 3. 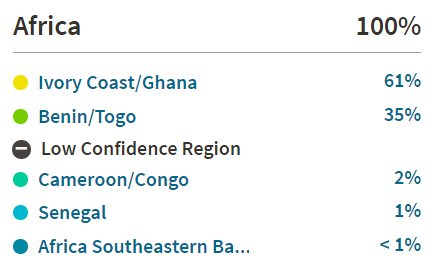 I will be working under the assumption that these “Ivory Coast/Ghana” and “Benin/Togo” scores are reported as main region and also with a considerable relative share within the complete African breakdown. Arguably the main regions appearing in your results might be more deserving of your research efforts. Your research results might then be more fruitful and covering a wider span of your ancestral make-up. As afterall the regions with the biggest amounts can be deemed to be more solidly based on your most important regional origins (even when taken as mere proxies). Therefore any reporting of “Ivory Coast/Ghana” and “Benin/Togo” as mere trace regions with low confidence will be left out of consideration. As the labeling already implies in such cases you are dealing with an increased possibility of a false positive or misreading of your DNA. Depending on the particulars actually such scores might still have informational value. But the array of ancestral possibilities simply becomes too broad for any meaningful discussion on this page. 4. 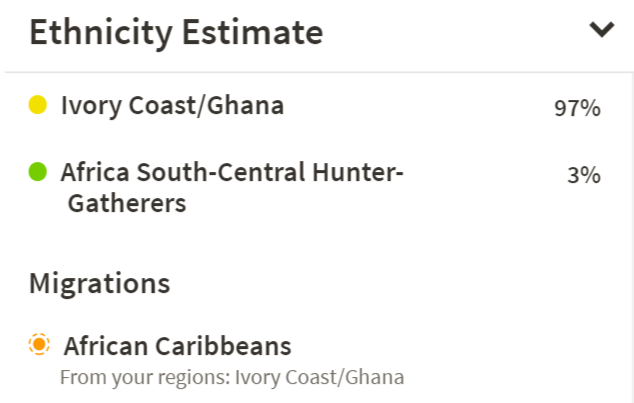 As my ongoing survey is demonstrating and also in accordance with Ancestry’s own information, so-called “Ivory Coast/Ghana” may be reported as a main region (above trace level) for people as far north as Senegal and as far east as Nigeria. However on average these scores are likely to be subdued and minor unlike the primary and even predominant amounts reported for Liberia and (southern) Sierra Leone. It’s reasonable to assume that generally speaking such small DNA amounts will hardly be detectable for Afro-descendants after many generations of genetic recombination and dilution. Especially when only taking into consideration Afro-Diasporans with substantial amounts of “Ivory Coast/Ghana”. 6. It should be pointed out that only Trans Atlantic slave voyages are being included in charts 5.3, 5.4 & 5.6 as well as map 5.3. And not Inter-Colonial slave voyages! So this data is not intended to reflect the full picture. For example largely undocumented English contraband slave trading was very significant for the Hispanic Americas and to a lesser degree also Haiti (“Saint Domingue”). While for the USA especially Domestic Slave Trade from the Upper South looms large. In order to avoid any potentially misleading information I have therefore left out the highly incomplete data for the Dominican Republic, Puerto Rico and Louisiana. As it is least likely that their African origins will be reasonably well represented by the TAST database. For all places mentioned obviously also post-Slavery migrations should be taken into consideration (for more disclaimers see this page). 9. This section is mostly based on an earlier blog post I wrote in 2015: Is “Benin/Togo” really pinpointing origins from within Benin’s borders? To date it remains one of my most popular blog posts. Especially in 2017 when it was by far my most read blog post (around 14,500 views). 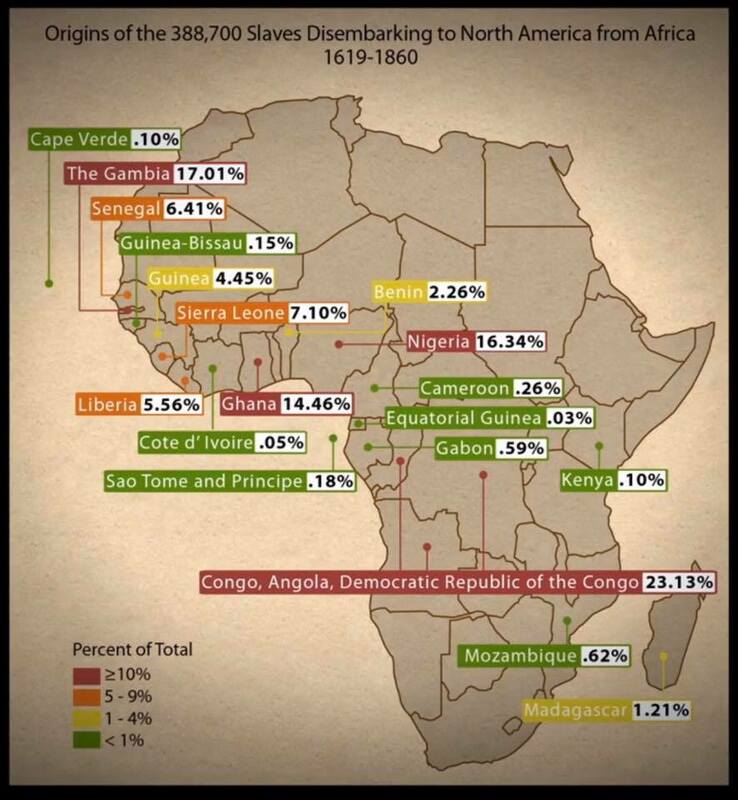 Indicating perhaps how especially this so-called “Benin/Togo” region has captured the imagination of many African Americans and other Afro-descendants while trying to make sense of their AncestryDNA results. As I will continue to say the country name labeling should not be taken too literally. However if you make an effort to inform yourself of the wider context and learn how to interpret correctly this usually unexpected regional score for many people could still prove very insightful in their quest to Trace African Roots! Salut! Haha it’s very intriguing indeed! As I told you i have come across such puzzling SE Bantu scores for other West Africans as well. And just very recently I’ve added a new result from Guinea Bissau (Fula Preto) who has an unexpected “Nigeria” score of 19%!!! Perhaps due to trading connections with Hausa-Fulani in northern Nigeria? Either way like you said African migrations across the continent should be taken into account. Although I’m also very curious to know what will happen with these scores after Ancestry does their update. Plus also looking into DNA matches might provide further clues. But the historical context definitely matters! So that’s a great idea to look into the slavevoyages database. I hadn’t thought about that myself yet. Very fascinating to get so much detail. And especially the Liberia / Windward Coast numbers do make such a scenario more plausible. It also reminds me how apparently all Krio people are called “Congo’s” in Liberia. The source you posted come as a great supporting evidence :D, which explains very much the minor Mali we see among many Akan….however, I am really surprised by the fact that as early as the 15th century slaves were also imported from regions as far as the Congo in Akan territories, thank you for the information, I ll try to dig further and will notify you if I find some interesting info/articles. Concerning the Guinea Bissau Fula, you are probably right on trading connection with Hausa-Fulanis. Does he have some minor Benin/TG and/or Cameroon as well? Because if he does, I think another possibility could be disembarked slaves coming from Bight of Biafra and Bight of Benin during the TST. 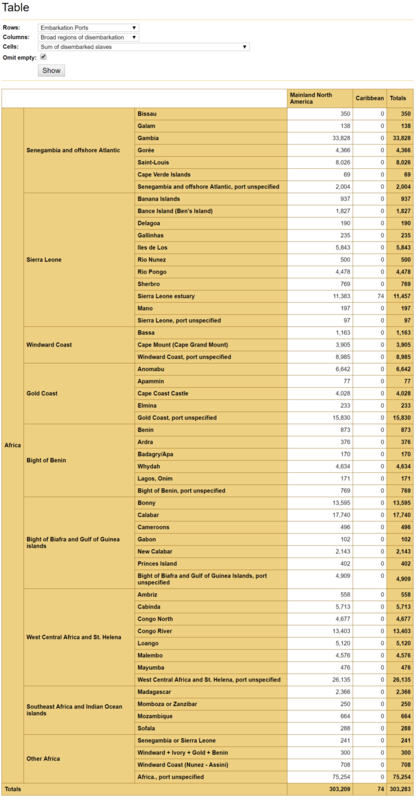 Based on Slavevoyages again, the Senegambia and Offshore Atlantic (Guinee Bissau and Cape Verde included) received a bit more than 250 disembarked slaves from the Bight of Benin and 900 from the Bight of Biafra between 1657 and 1828…I can send you the spreadsheet that I queried from their database if you want, which shows the number of African disembarked to other African regions between 1514 and 1900. Based on this same website the number of disembarked slaves in the Gold coast is estimated at 145 between 1794 and 1823 coming from the Bight of Biafra and Gulf of Guinea Islands (specifically Calabar and Gabon). In the windward coast the disembarkations occurred pretty late between 1845 and 1861 which made it easy for them to conserve their original names (Congo) and assimilate to Americo-Liberians who arrived somewhat during the same period. However I think other regions which received disembarked slaves (in earlier periods) who were sold to natives of these regions assimilated to the locals (which is probably the case with the 145 Biafran disembarked in the Gold Coast). The person from Guiné Bissau doesn’t have any other unexpected regional scores, at least not in substantial amounts. He’s 55% “Senegal”, 21% “Mali”, 19% “Nigeria”, 2% “Africa North”, 2% “Ivory Coast/Ghana” and <1% “Benin Togo”. I’m going to look into his DNA matches to see if i can uncover any connections with (northern) Nigeria. I will have more details when I finish the follow-up to this page. It’s very fascinating though what you found in the Slavevoyages database. I have a feeling these people were being settled in Gambia especially where a small Krio population (also called Aku) still lives. 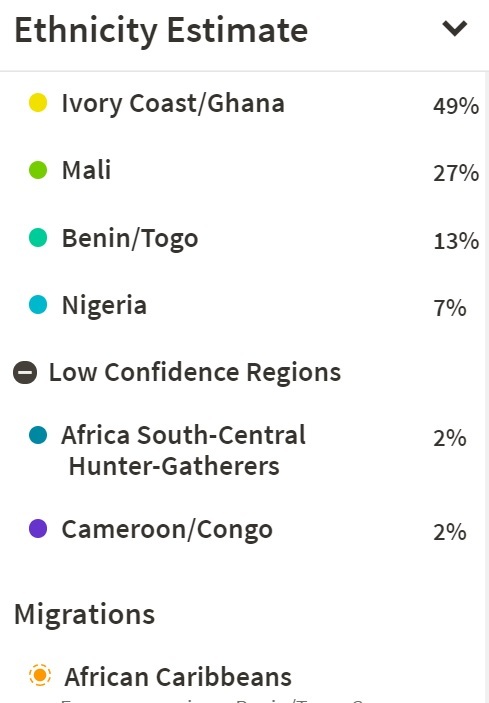 I actually have one Gambian result in my survey whom i suspect has partial Aku lineage (aside from Wolof and Fula) she has 12% ” Benin/Togo” and also 7% “Southeast Bantu”! She made a Youtube video you might already have seen, it seems to be down now though.